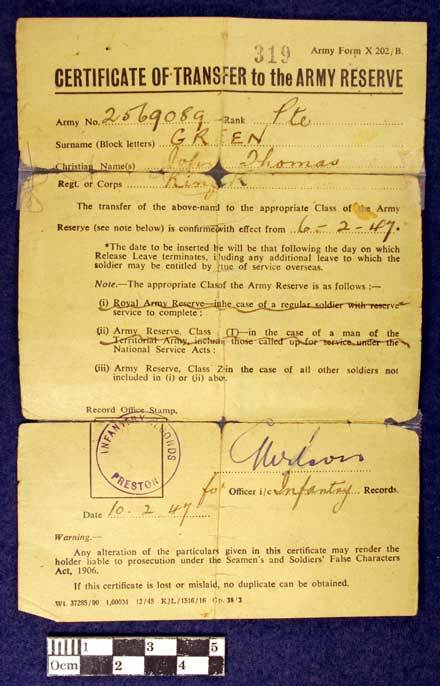 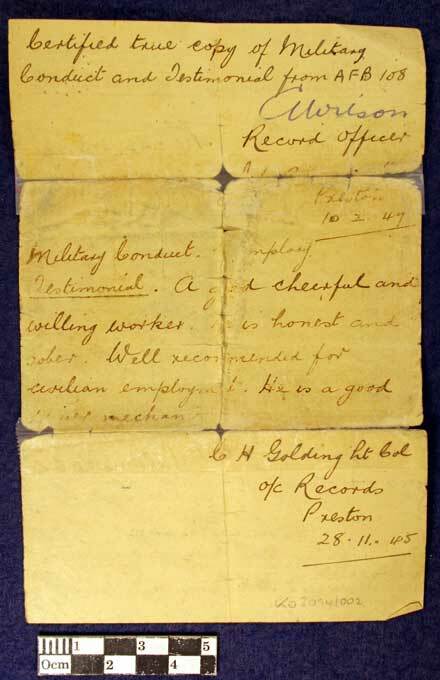 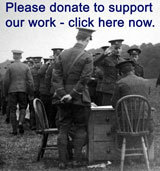 Collection relating to the service of Private John Thomas Green, number 2569089, 1st Battalion, King’s Own Royal Regiment. 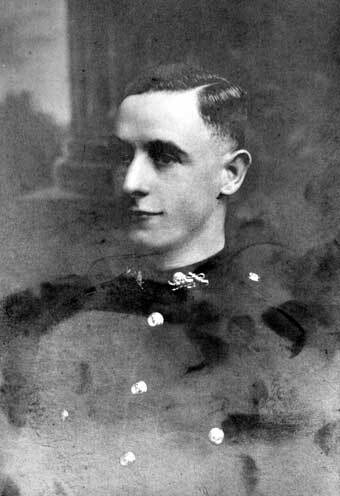 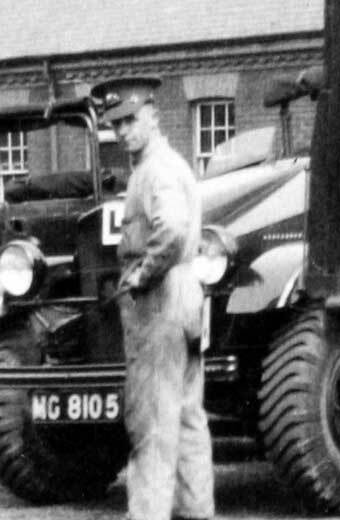 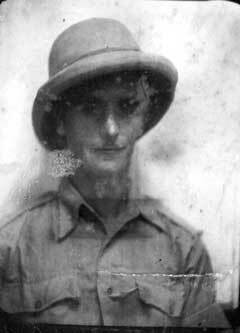 Private John Thomas Green, in Number 1 Dress. 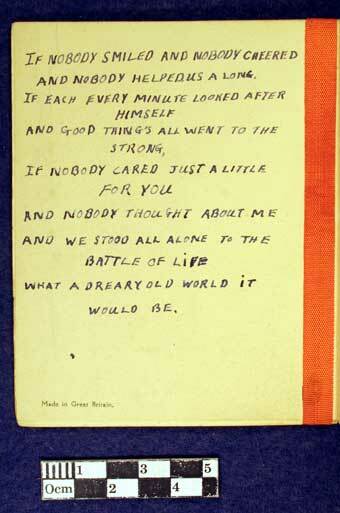 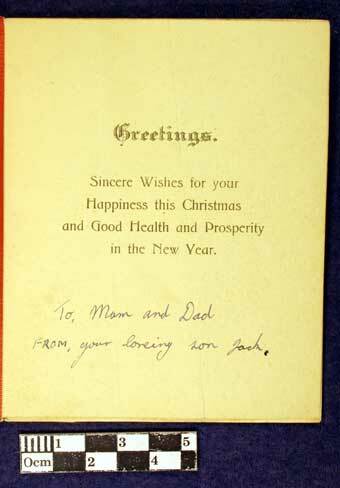 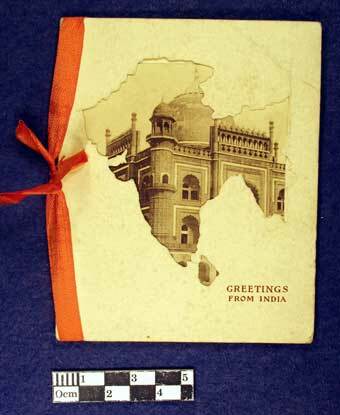 Card ‘Greetings from India’ sent home to his parents, late 1930s by Private John Thomas Green. 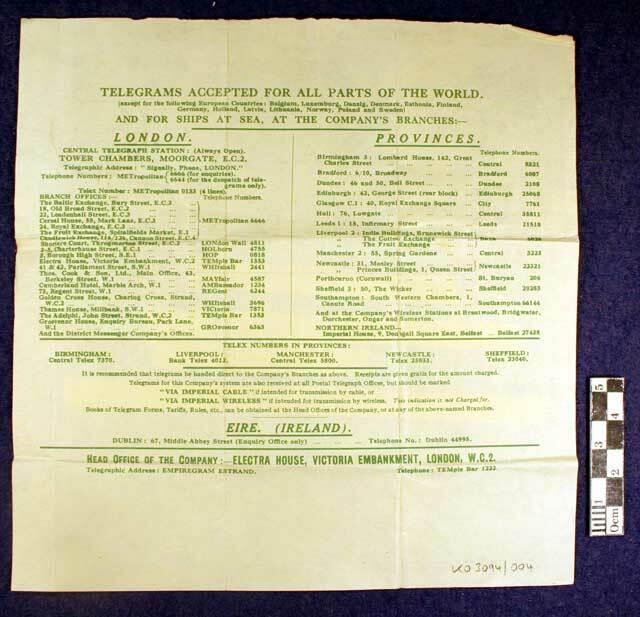 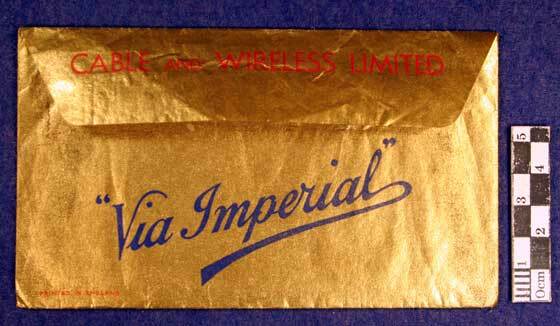 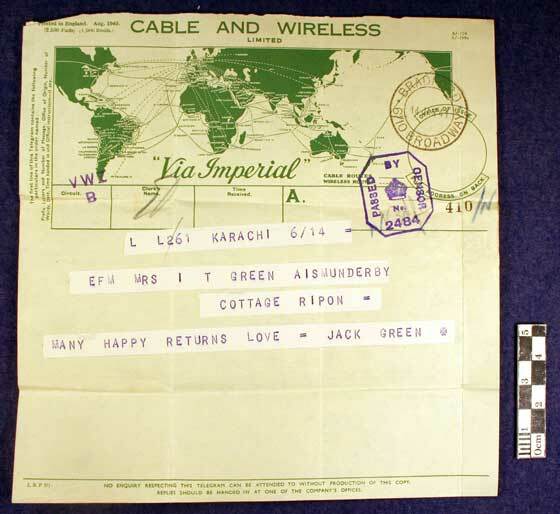 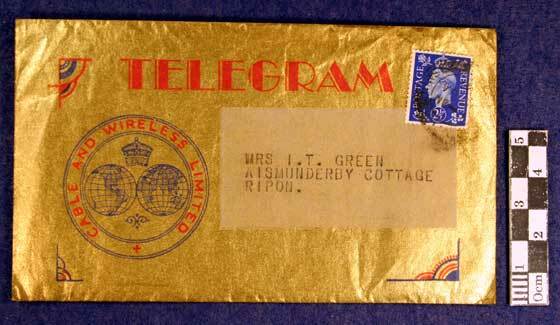 Telegram, dated 14 Jan 1941, sending birthday wishes to Mrs I T Green, from Jack Green, Karachi. 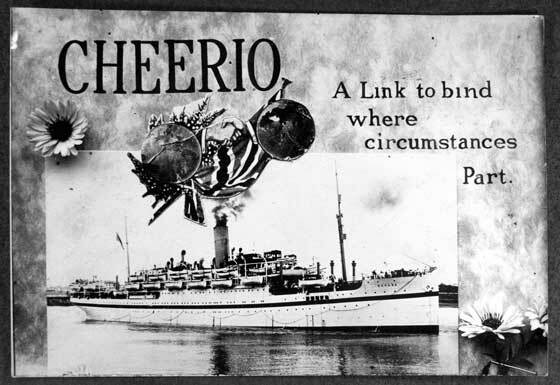 ‘Cheerio’ card with a photograph of HMT Nevasa, with message on rear to the wife of Private John Thomas Green, 1st Battalion, King’s Own Royal Regiment. 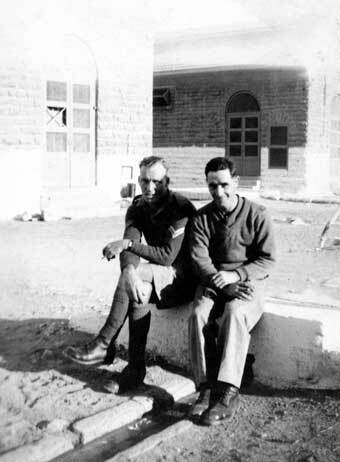 Two soldiers in barracks, Private Green at the rear, late 1930s. 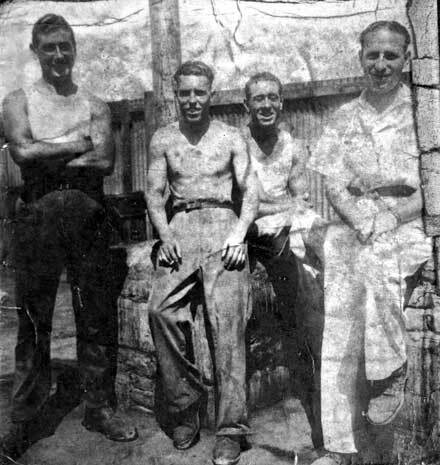 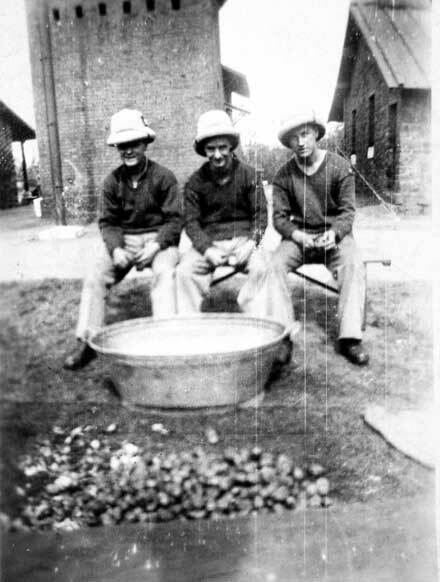 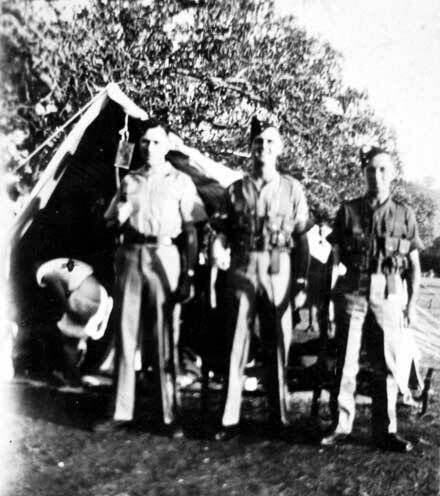 Three soldiers in barracks in India, Private Green in the middle, late 1930s. 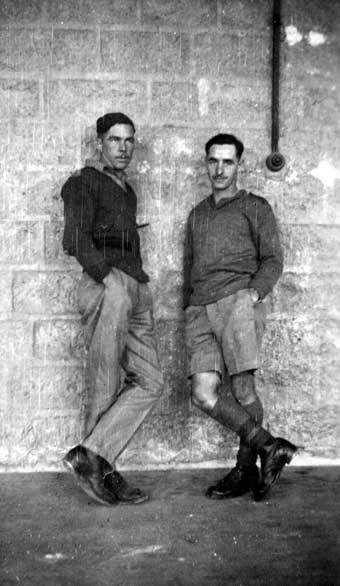 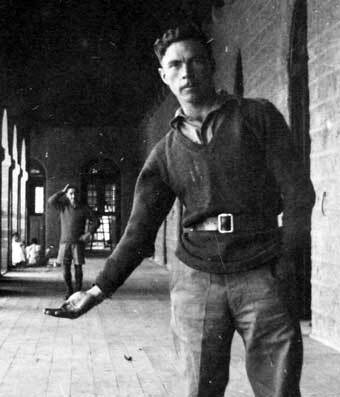 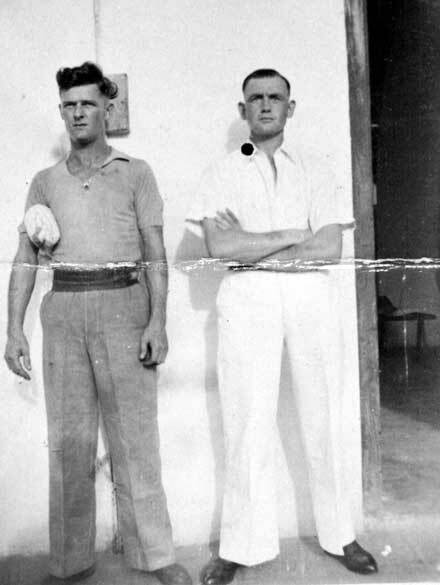 Two soldiers in barracks in India, Private Green on the right, late 1930s. 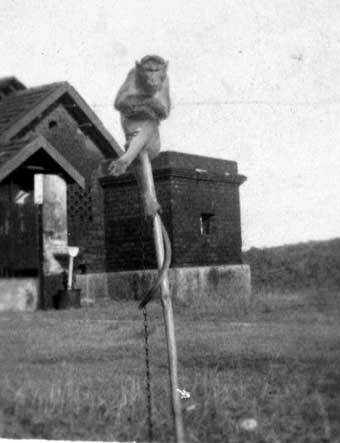 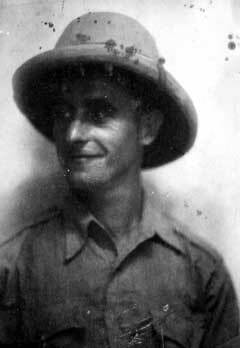 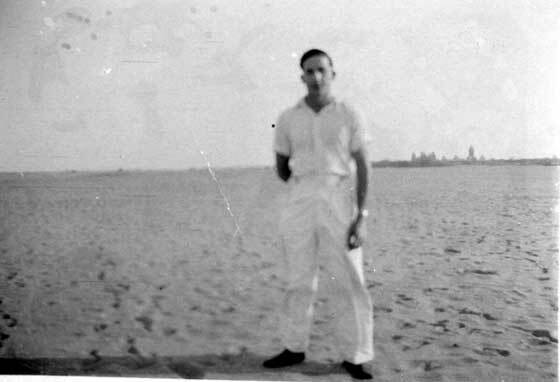 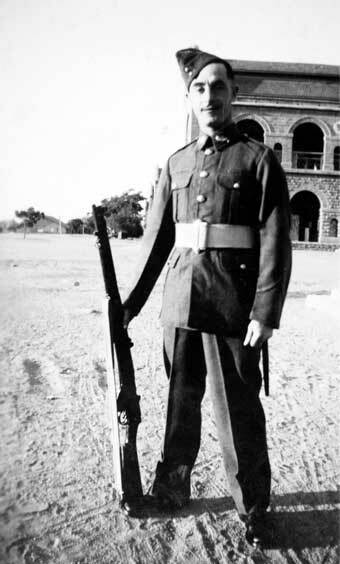 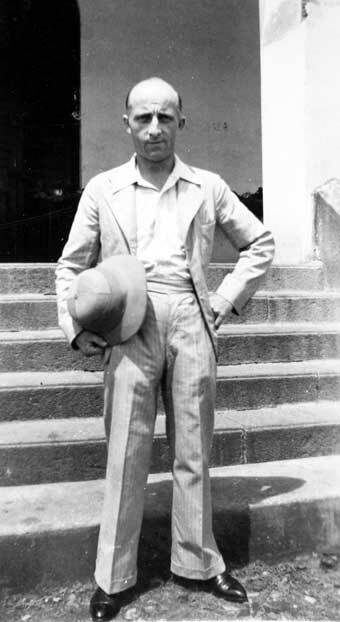 Private J T Green, on guard, India, late 1930s. 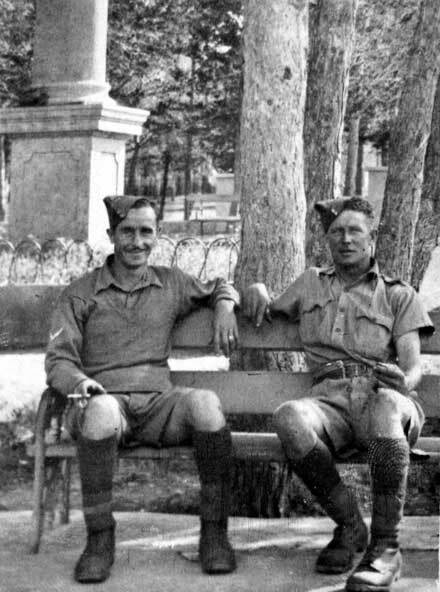 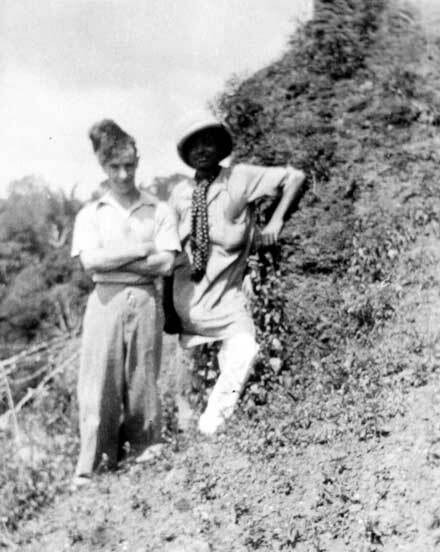 Two soldiers in fatigues, Private J T Green on the left, India, late 1930s. 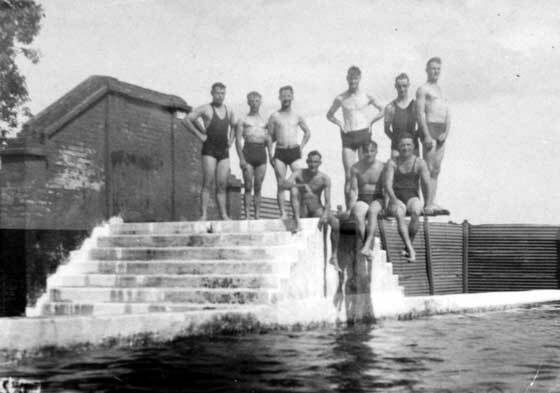 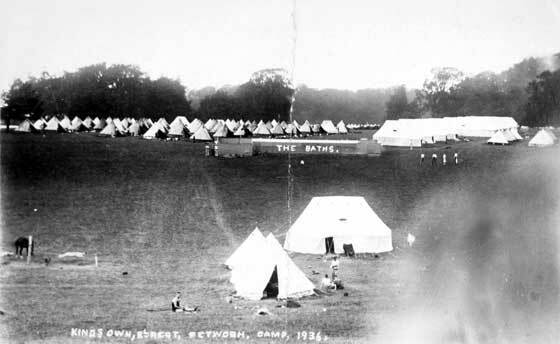 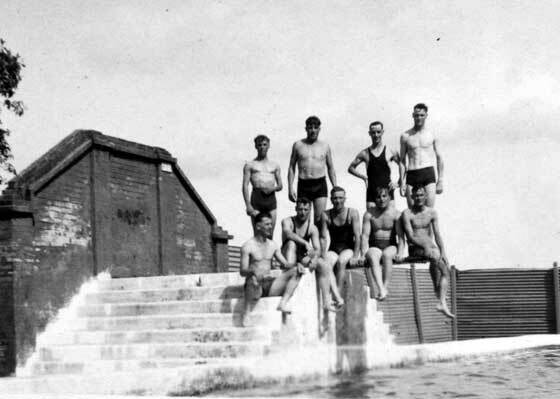 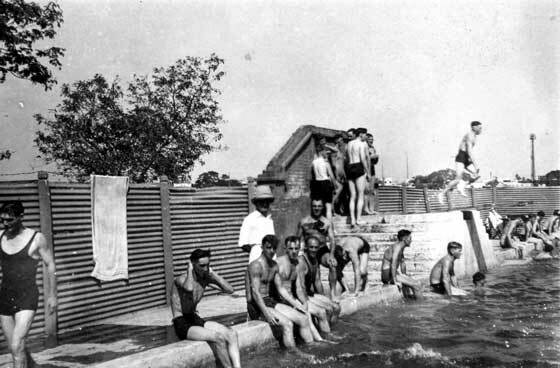 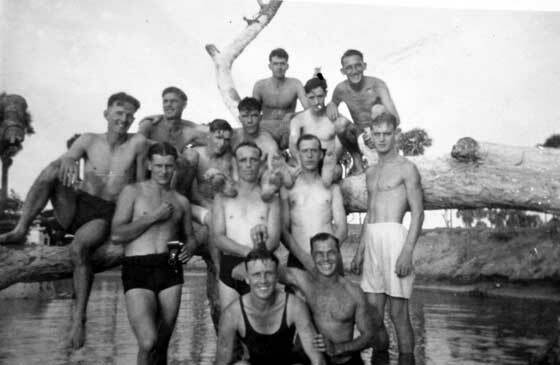 2nd Battalion, King’s Own at Petworth Camp, 1936, with ‘The baths’ show in tented camp. 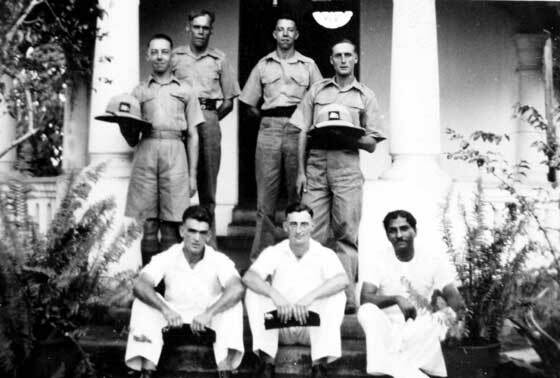 Group of four soldiers of the 1st Battalion, King’s Own, India, late 1930s. 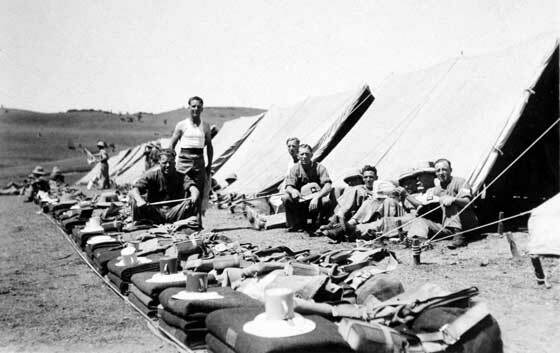 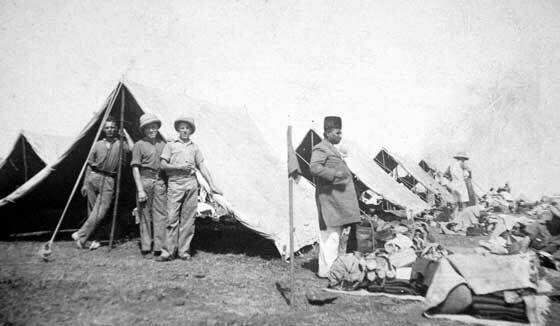 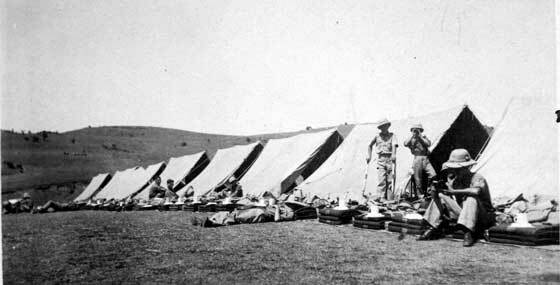 1st Battalion, King’s Own, field camp, with soldiers, tents and equipment laid out, India, late 1930s. 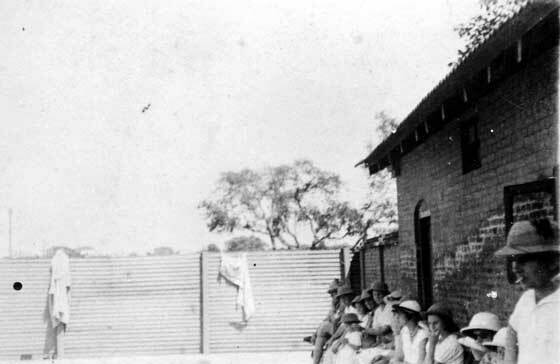 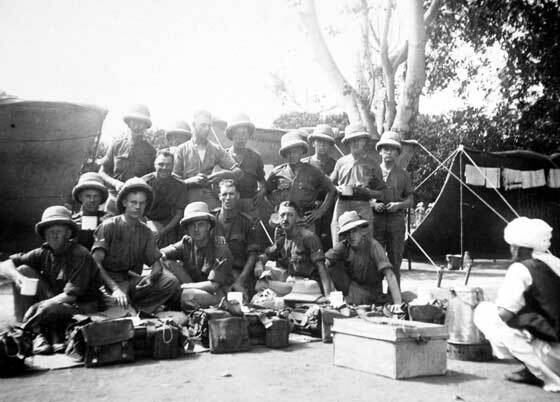 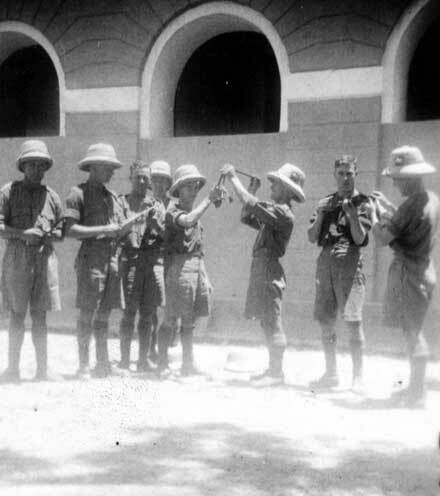 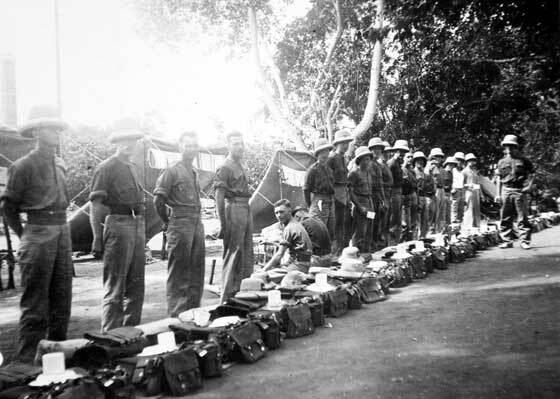 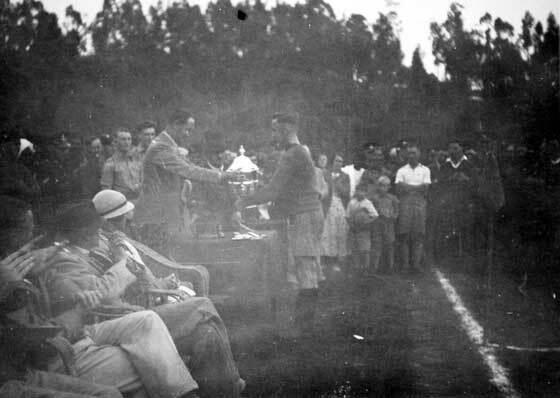 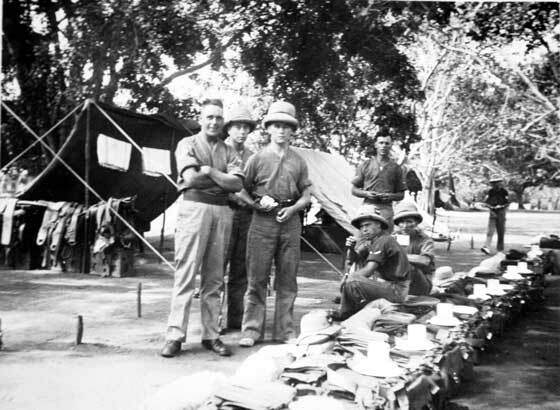 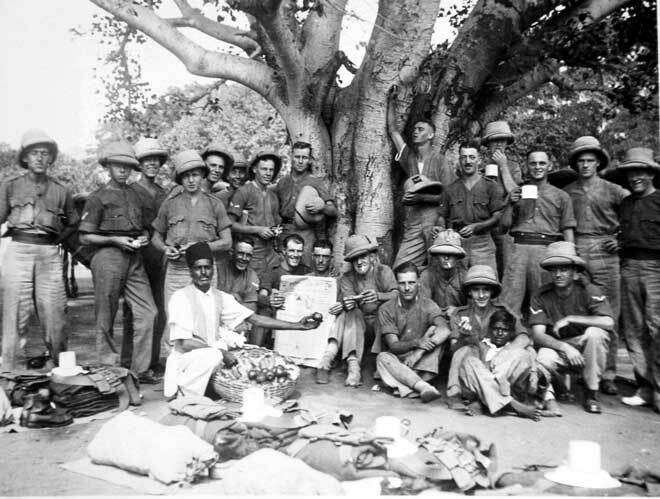 1st Battalion, King’s Own, field kitchens, India, late 1930s. 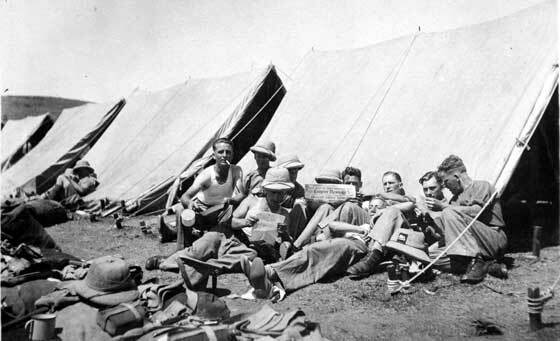 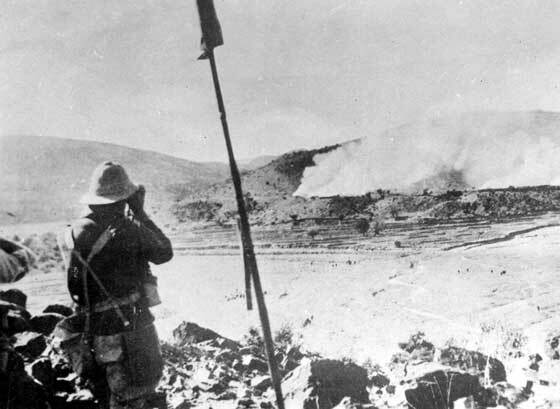 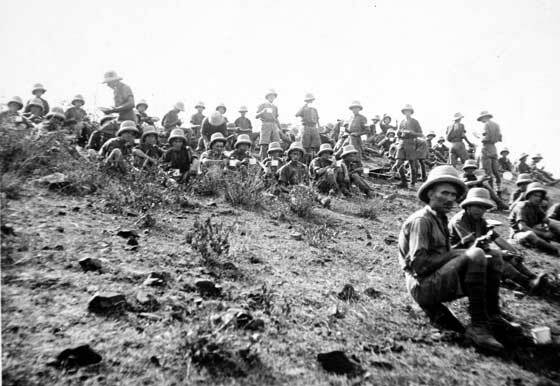 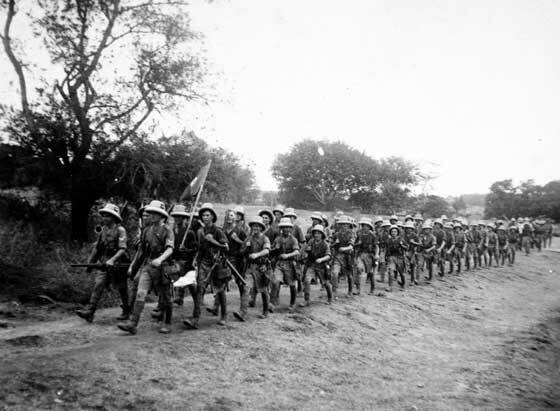 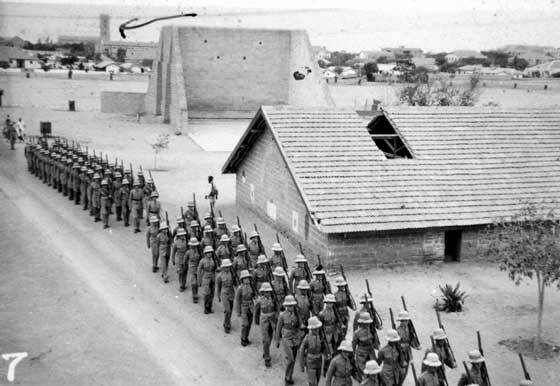 1st Battalion, King’s Own, field camp, India, 1938. 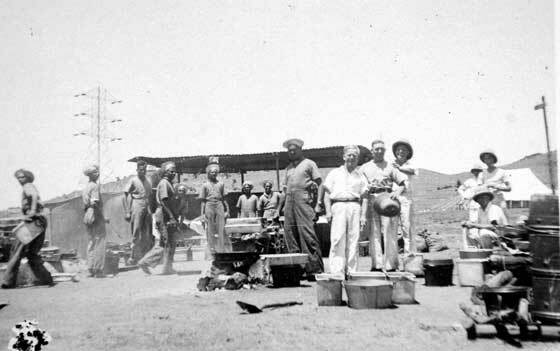 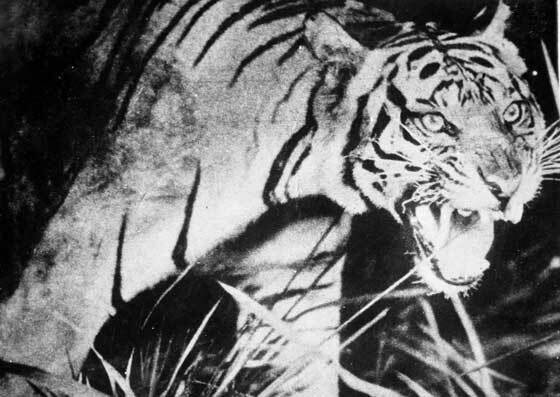 Feeding time, 1st Battalion, King’s Own, field camp, India, 1938. 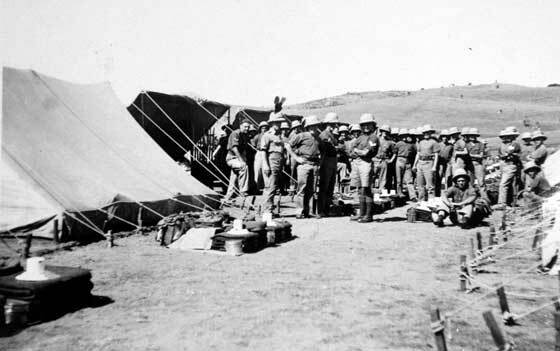 Royal Artillery with the 1st Battalion, King’s Own, field camp, India, 1938. 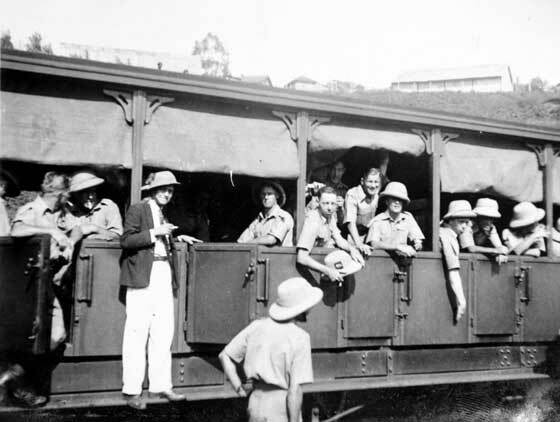 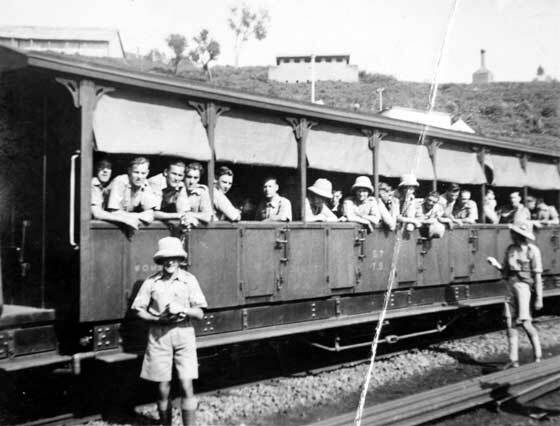 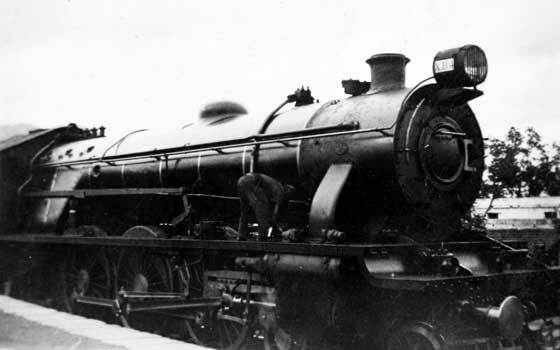 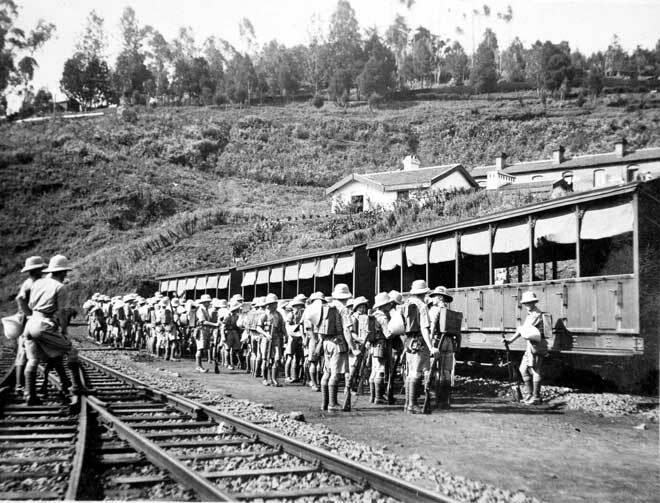 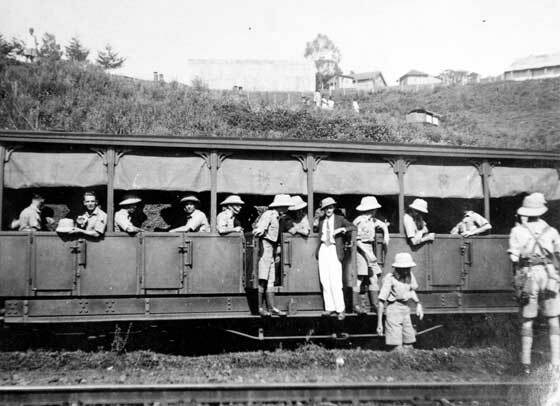 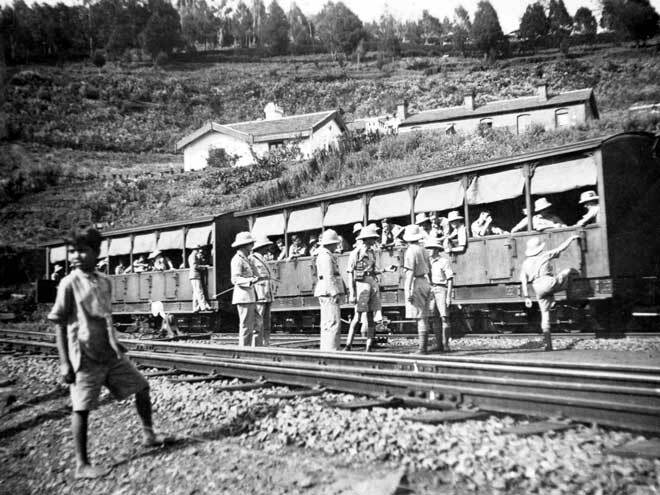 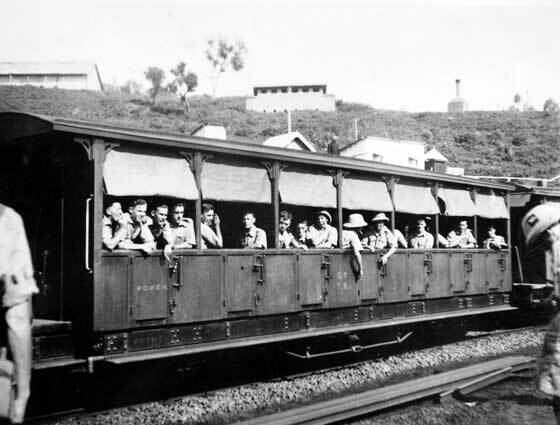 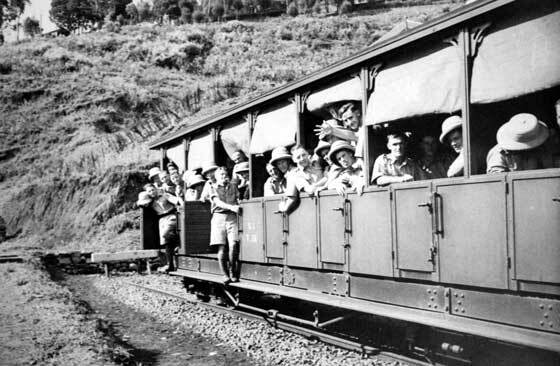 Soldiers in railway carriage, possibly Nilgiri Hill Railway, India, late 1930s. 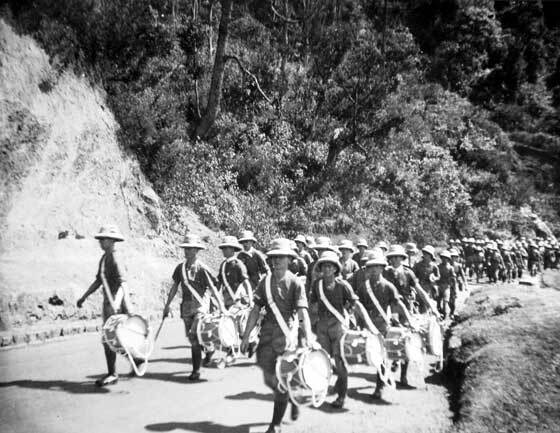 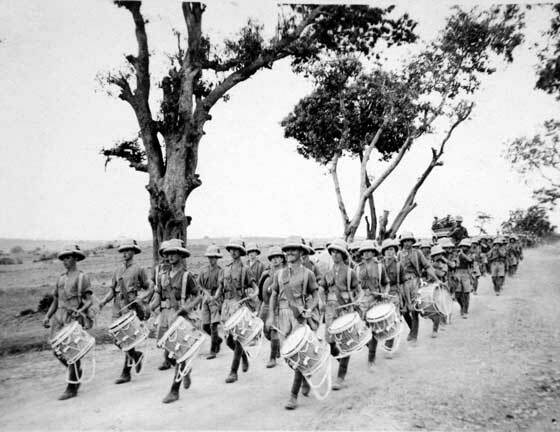 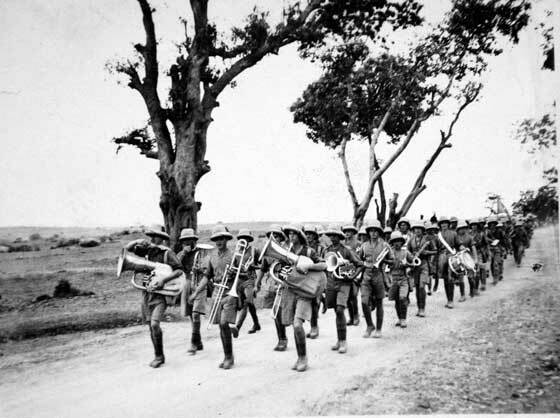 Band, 1st Battalion, King’s Own, India, late 1930s. 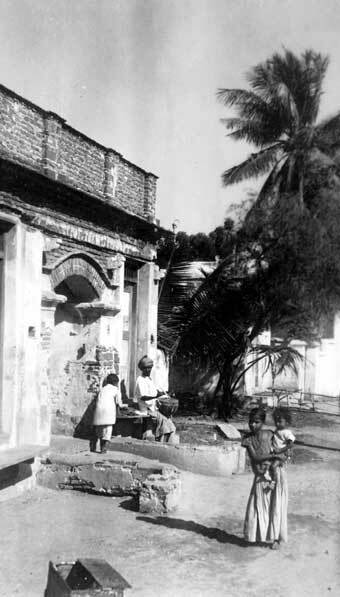 Soldiers cleaning rifles at Madras, India, 1939. 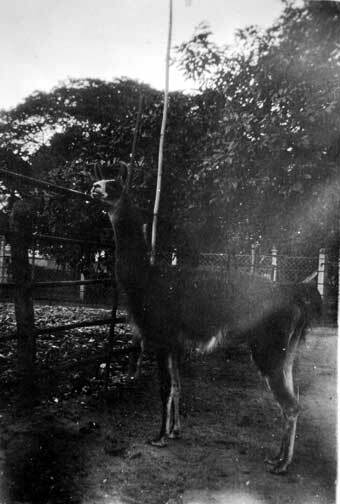 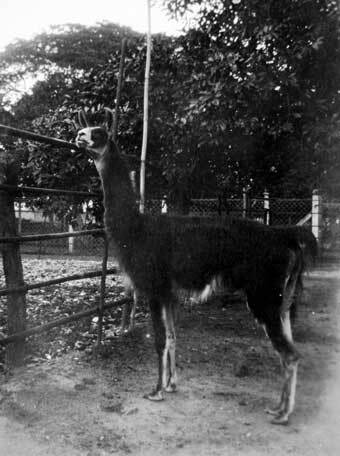 Animal at Zoo, Madras, India. 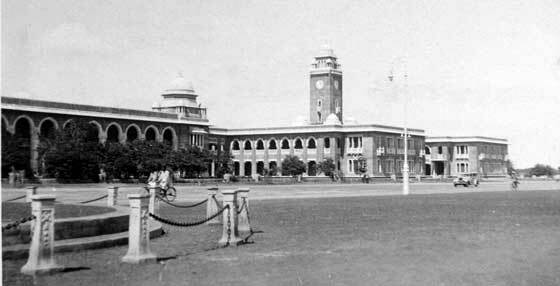 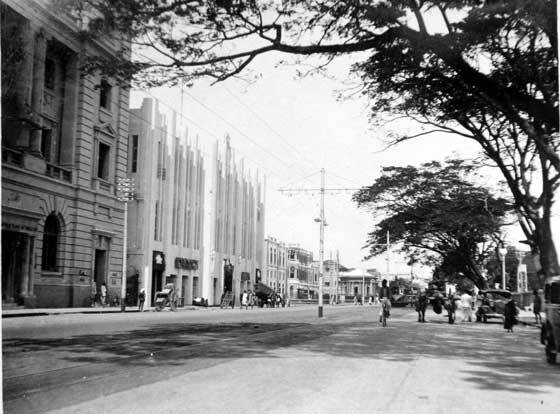 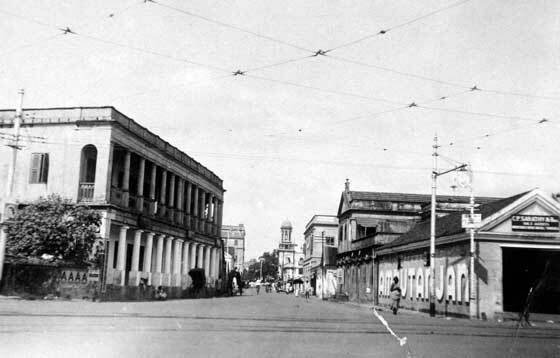 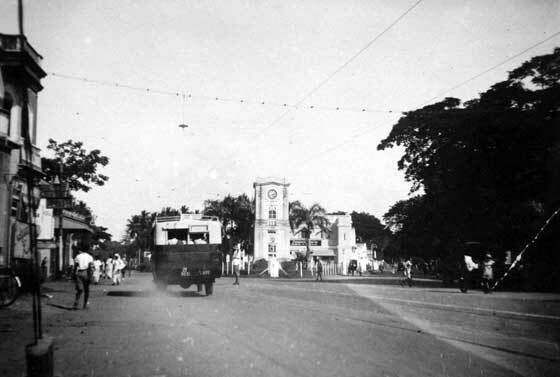 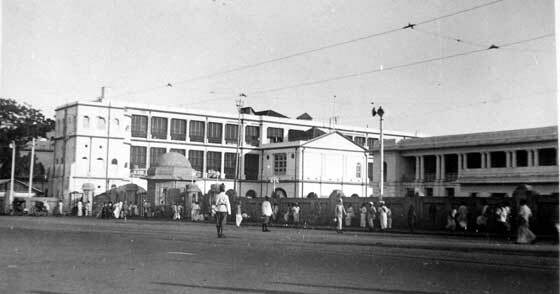 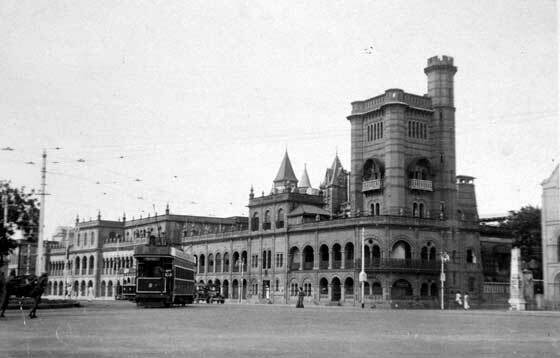 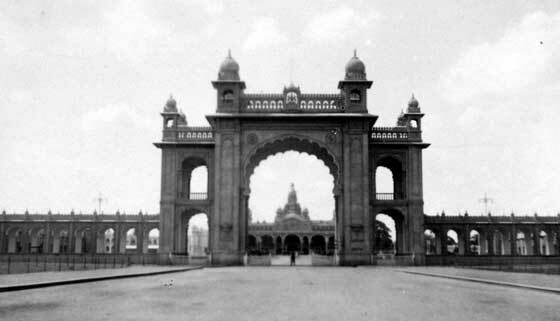 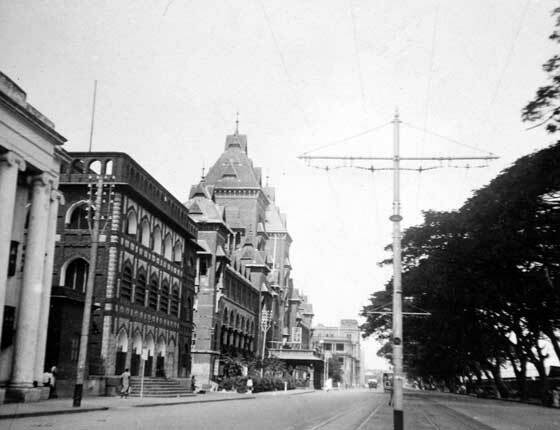 Dock Road, Madras, India, 1938. 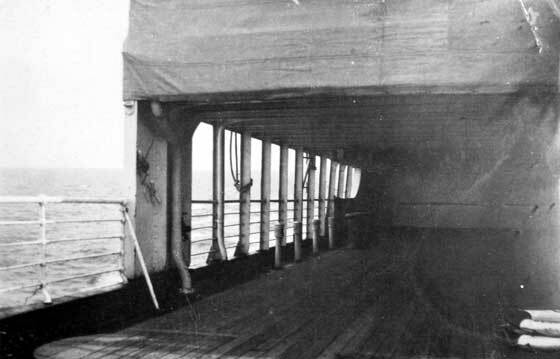 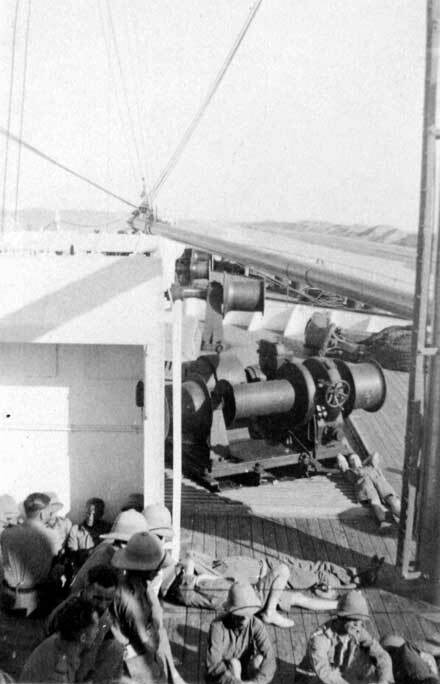 Troop deck on board ship. 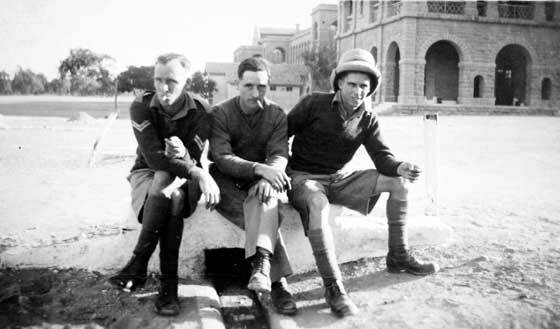 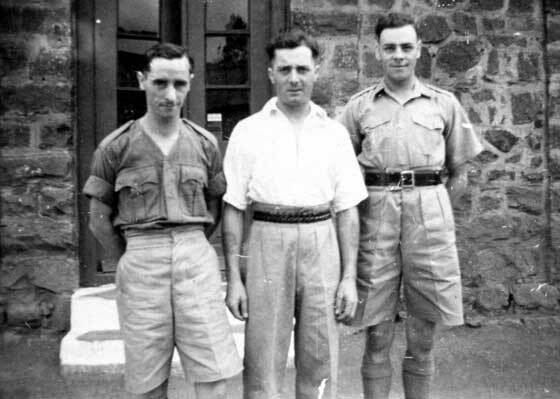 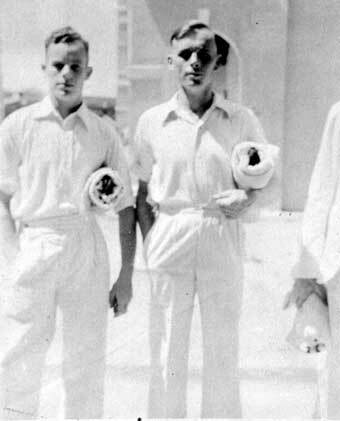 Three soldiers, 1st Battalion, King’s Own, India, late 1930s. 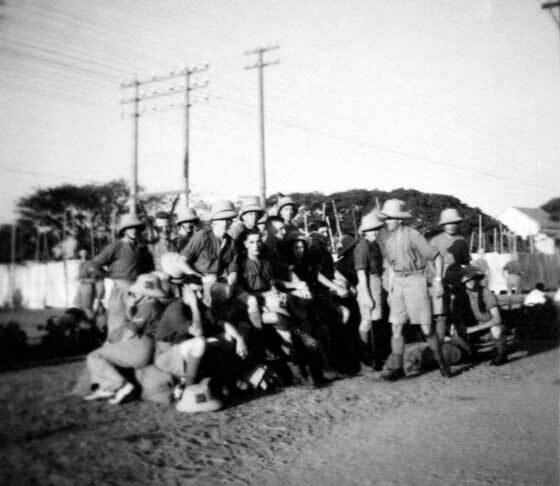 Soldiers with motor cycle, 1st Battalion, King’s Own Royal Regiment, India, late 1930s. 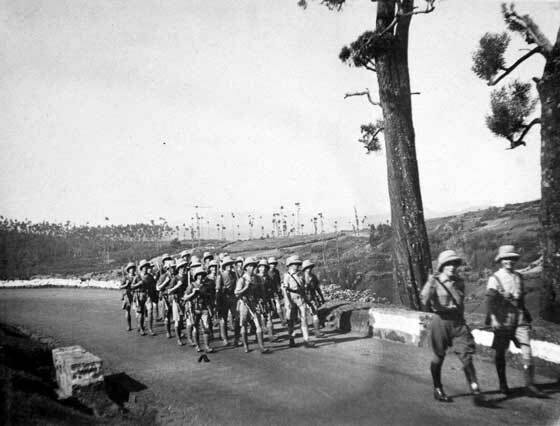 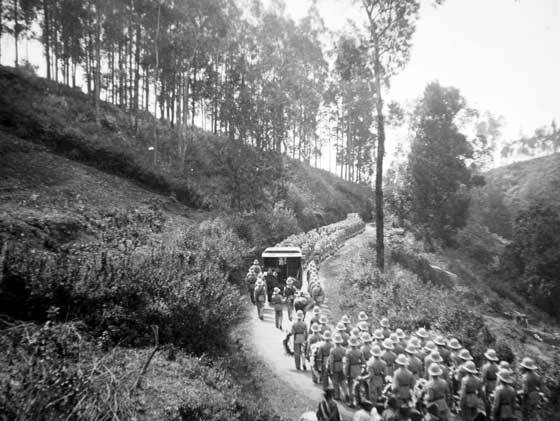 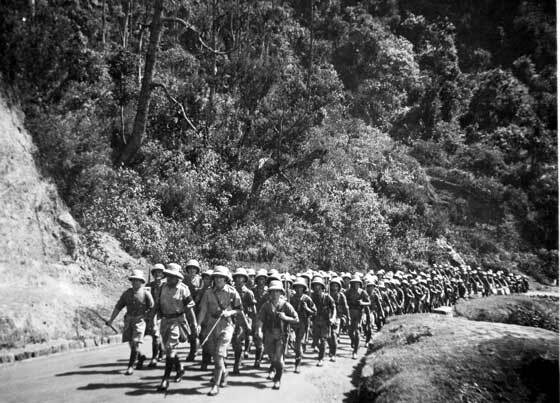 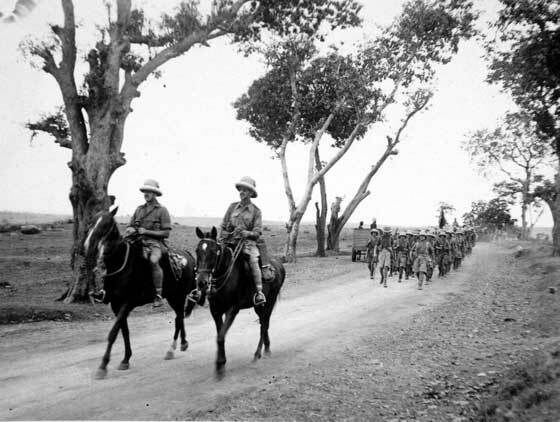 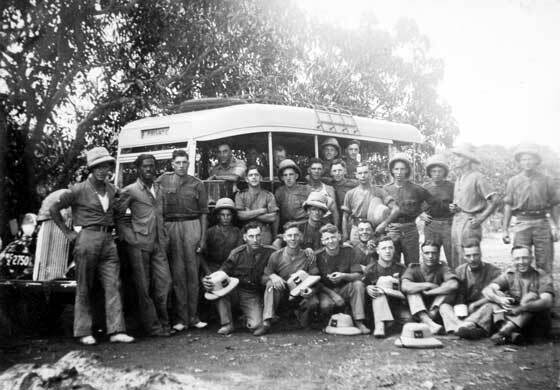 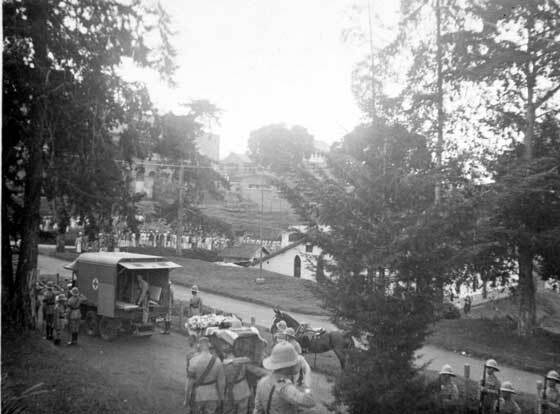 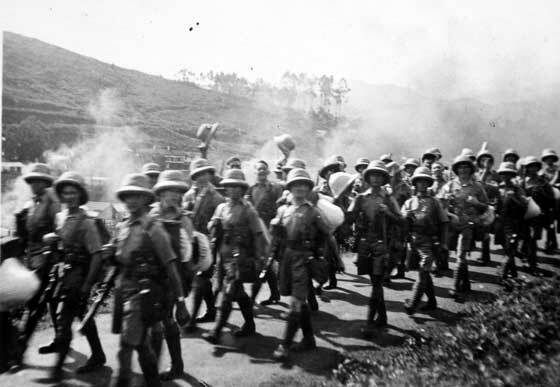 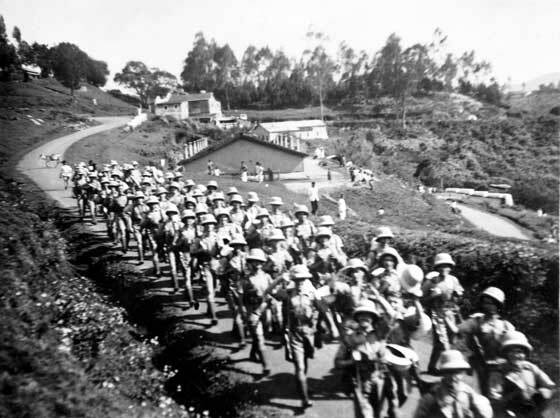 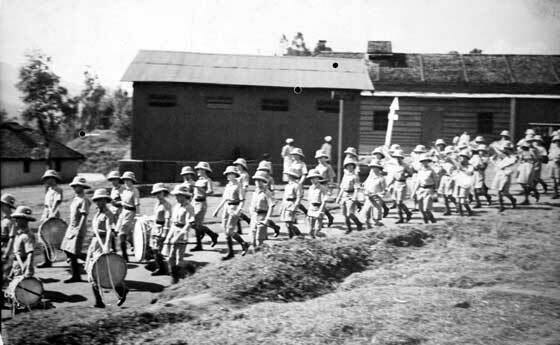 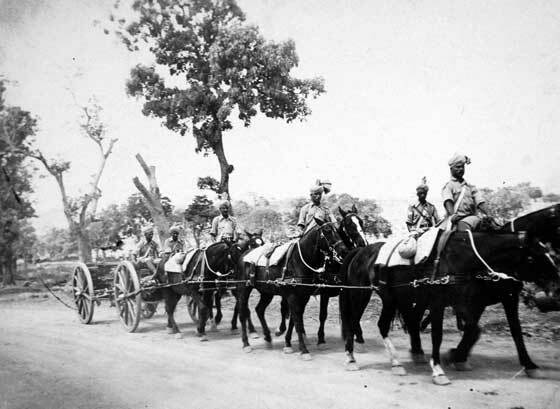 Group of soldiers going to camp, 1st Battalion, King’s Own, India, late 1930s. 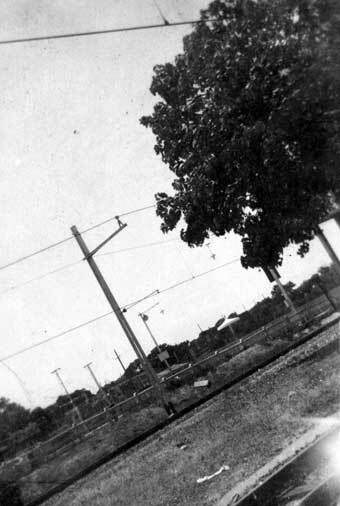 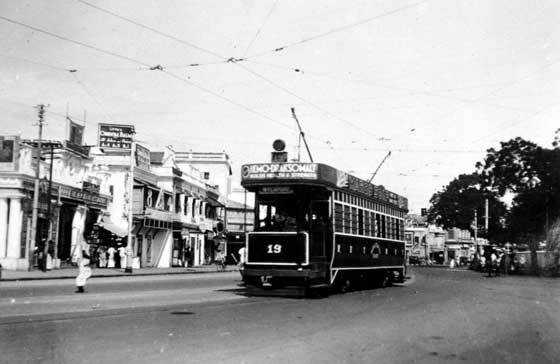 View of electric tramway, India, late 1930s. 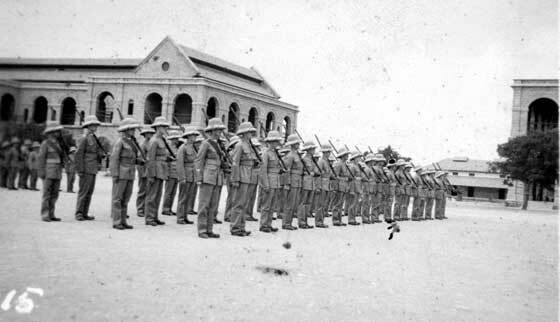 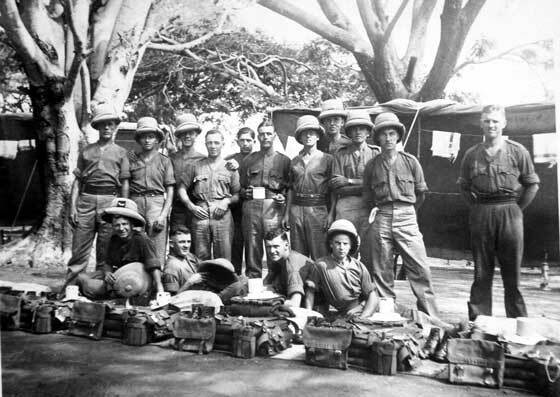 Group of soldiers 1st Battalion, King’s Own, India, late 1930s. 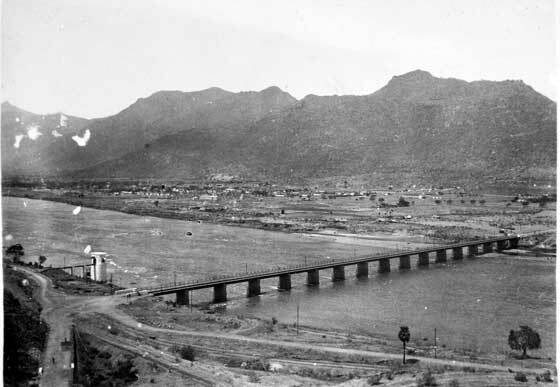 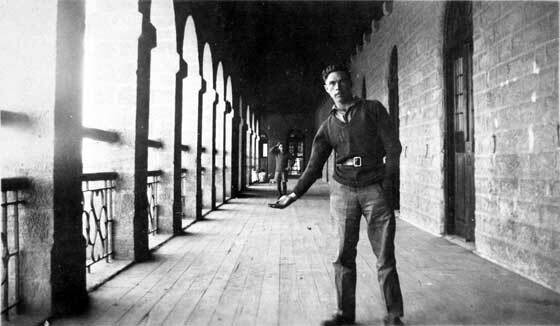 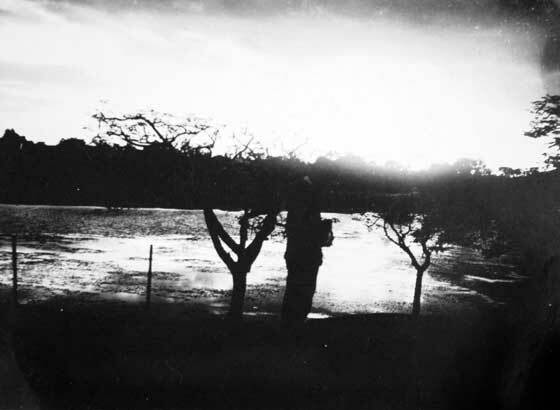 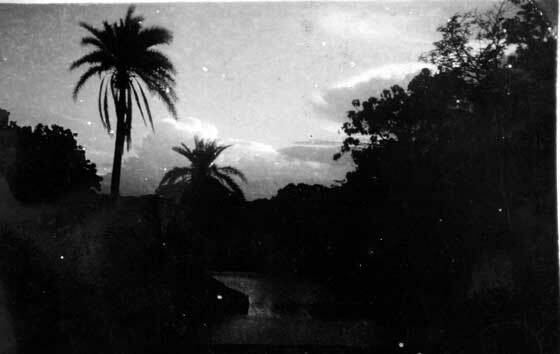 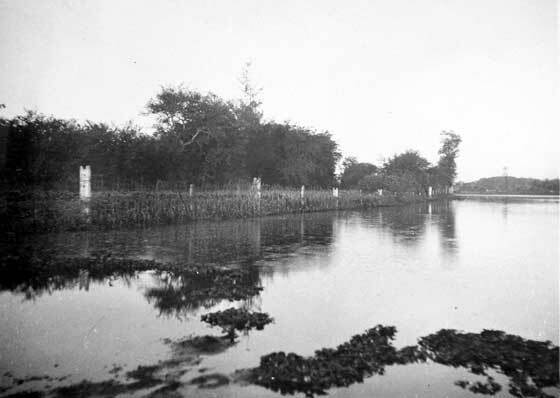 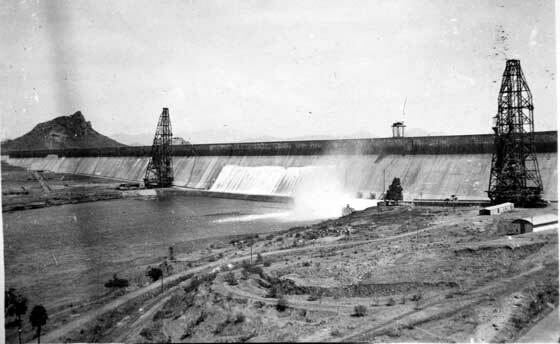 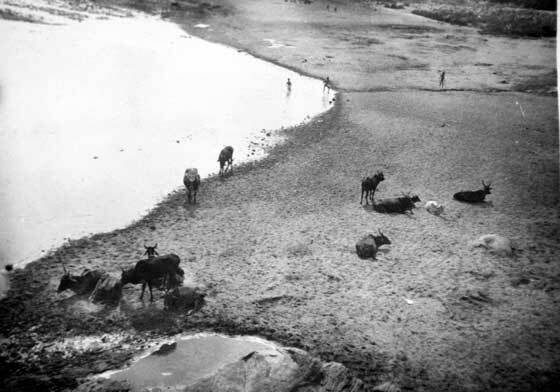 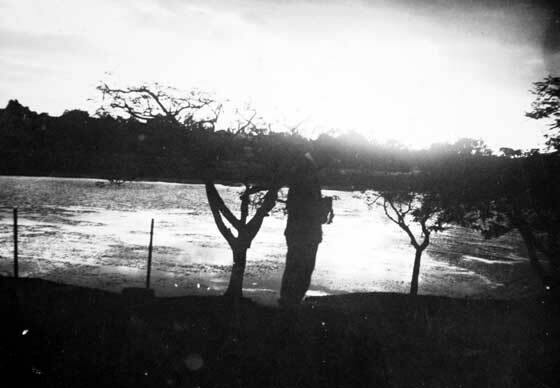 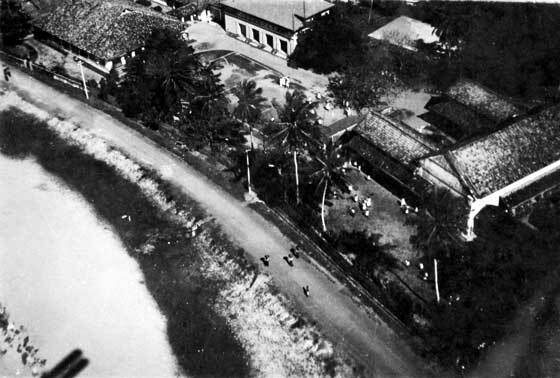 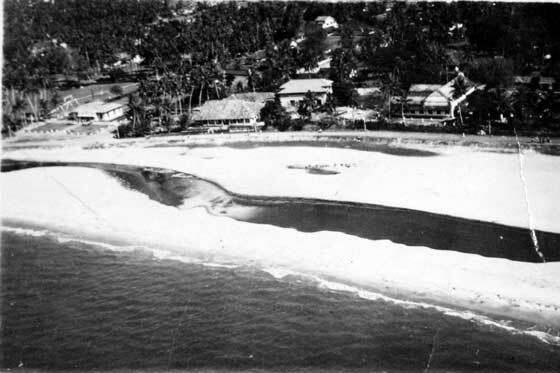 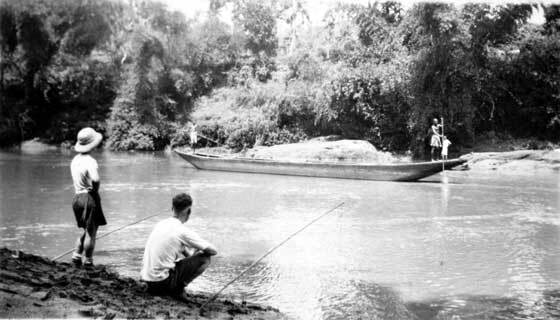 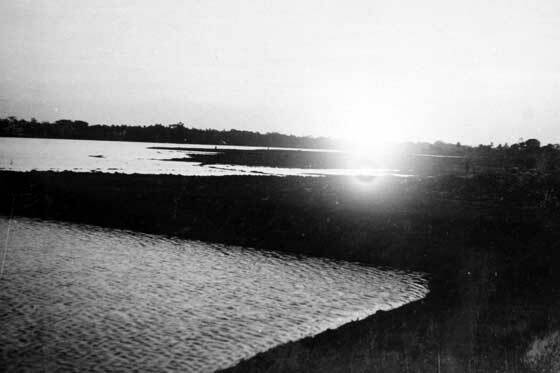 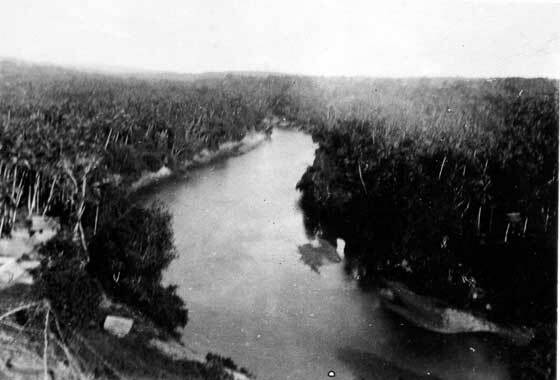 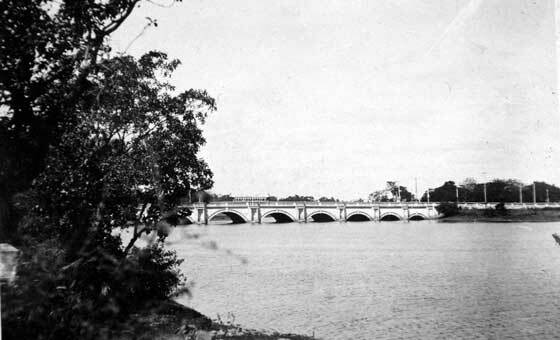 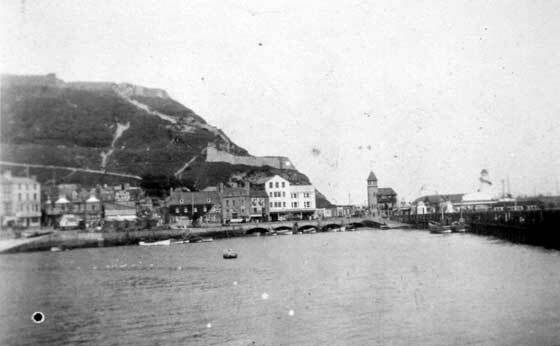 View of river from Barracks, India, 1930s. 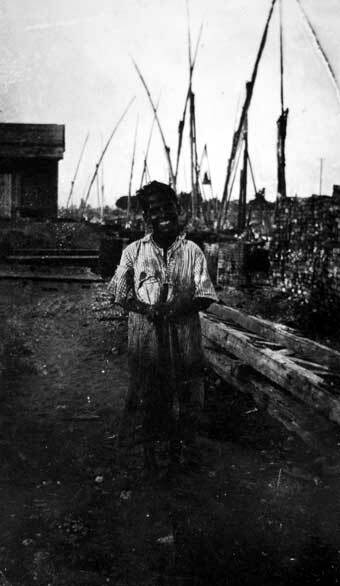 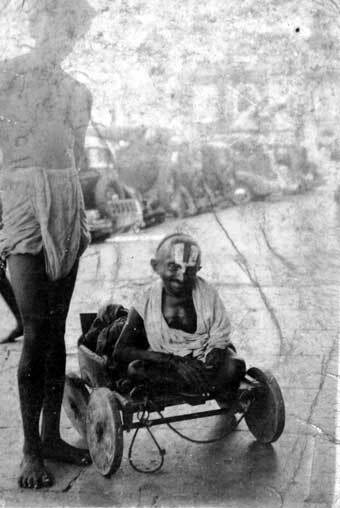 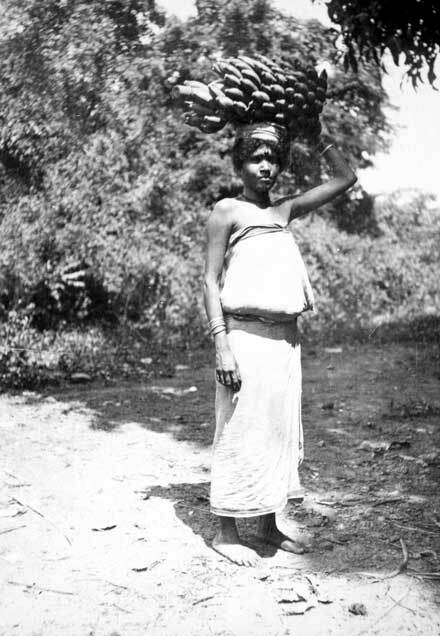 Beggar in Madras, India, late 1930s. 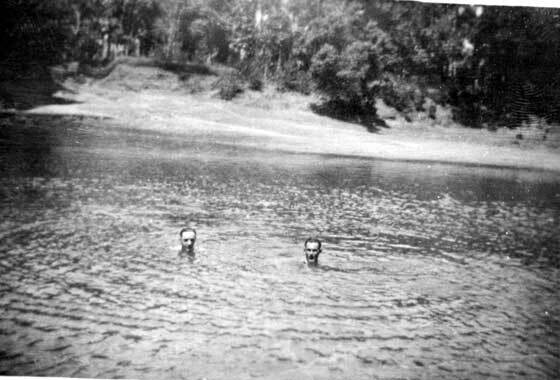 Two soldiers swimming, India, 1930s. 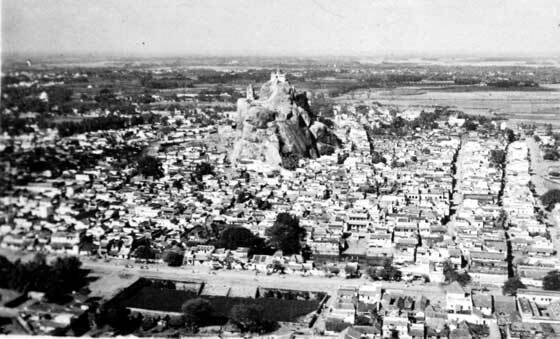 View of City, India, 1930s. 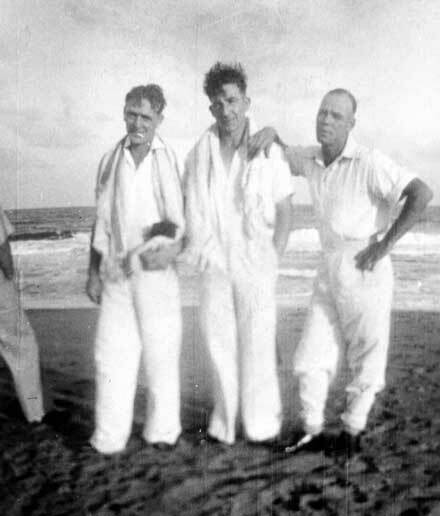 Three soldiers on beach, India, 1930s. 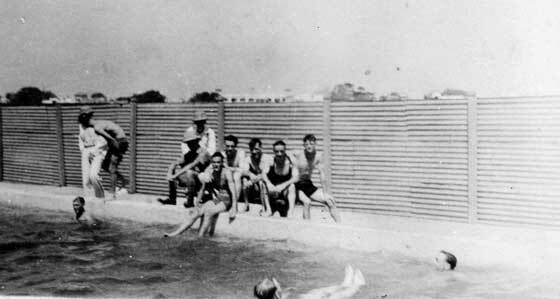 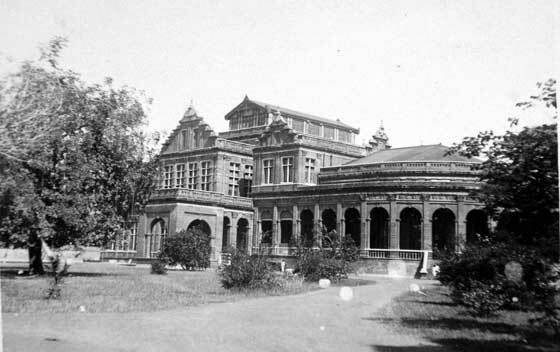 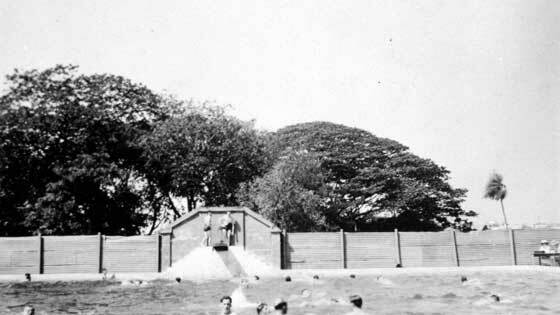 Swimming baths, Madras, India, 1938. 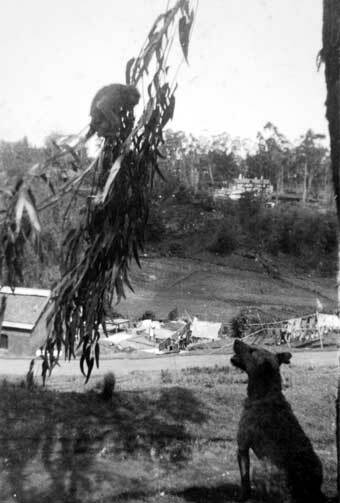 Dog barking at monkey in tree, India, late 1930s. 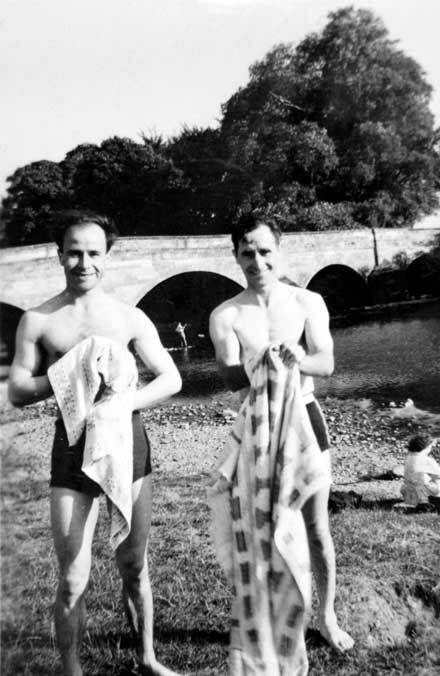 Two soldiers on river side after swimming, India, late 1930s. 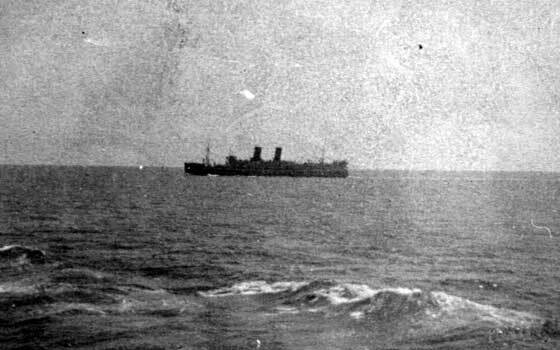 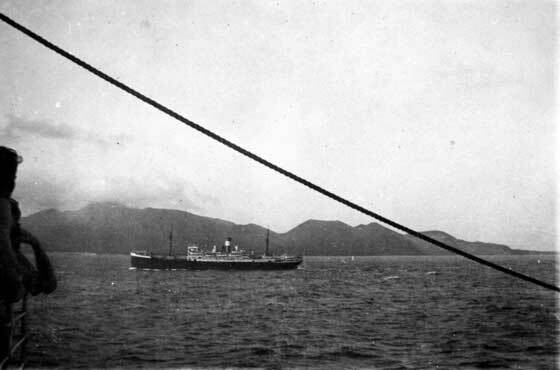 Passing the Royal Mail Ship Empress of India at sea, late 1930s. 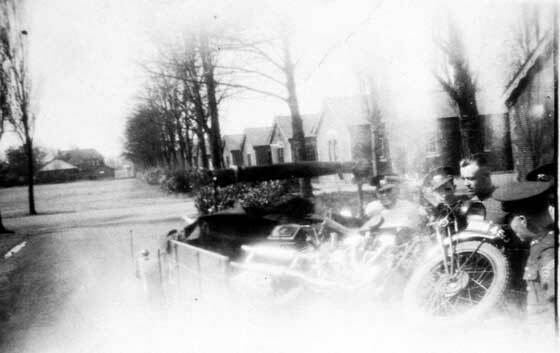 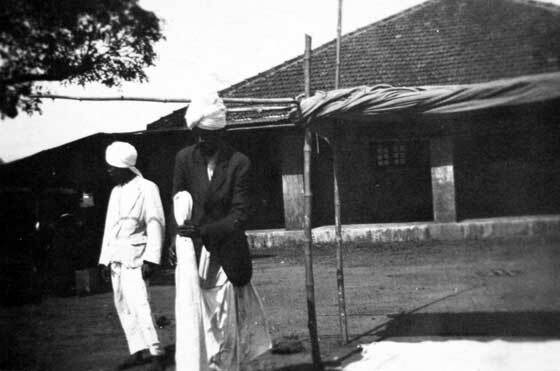 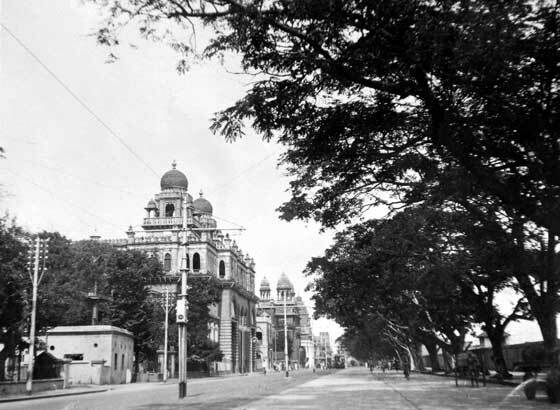 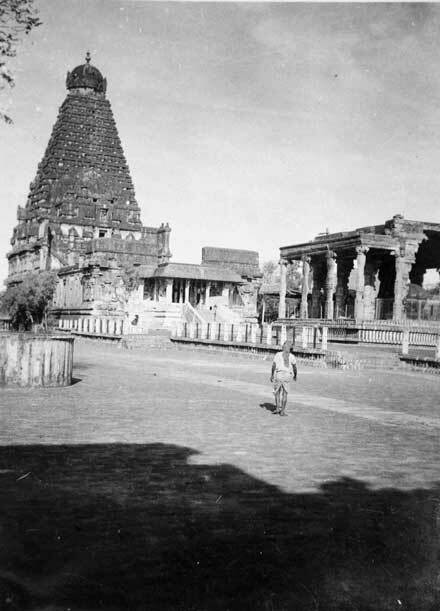 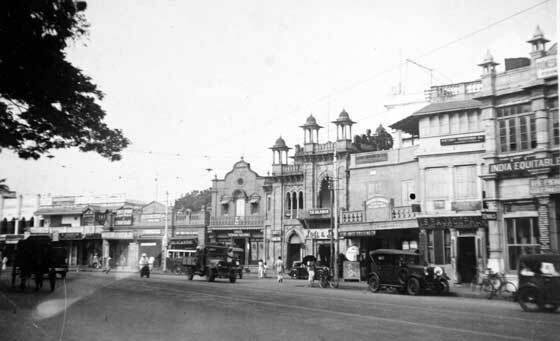 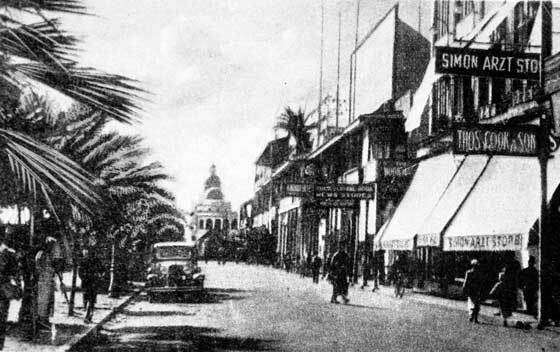 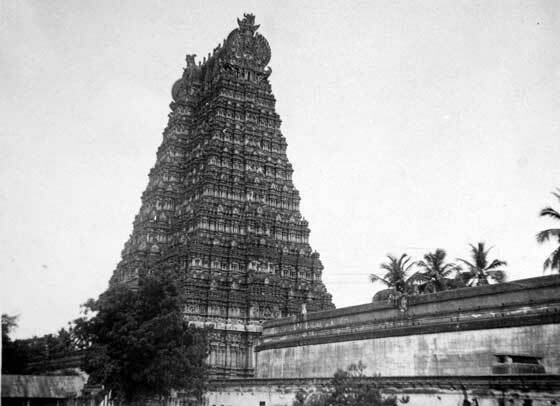 Street view in town, India, circa 1937. 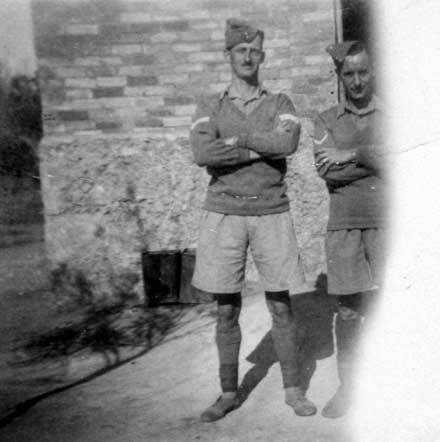 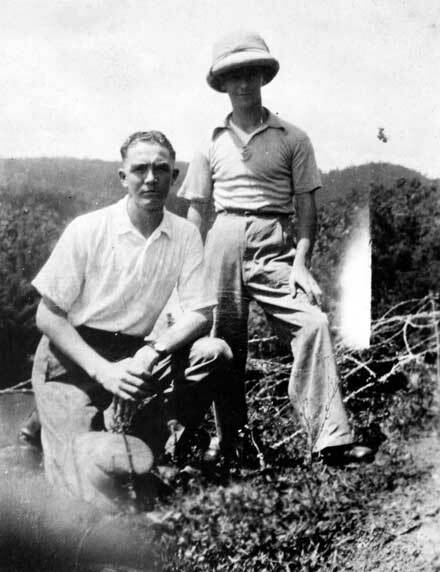 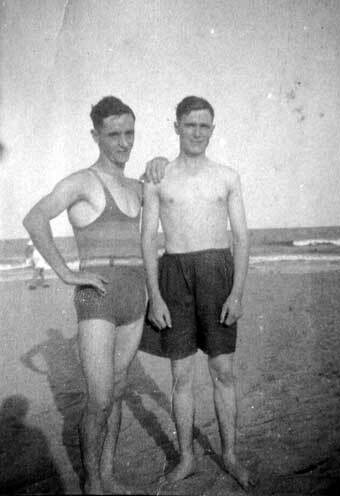 Two King’s Own soldiers, John Thomas Green on right. 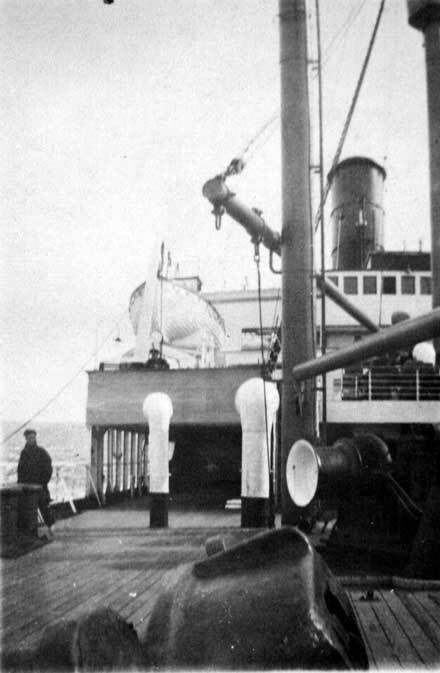 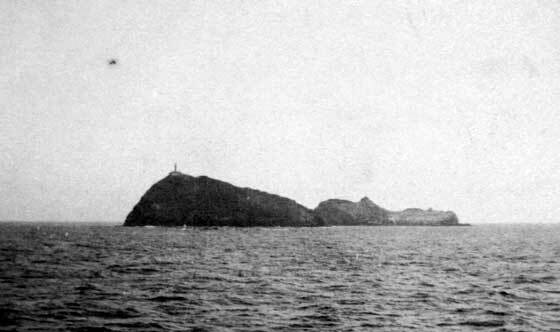 North Coast of Africa viewed from troopship. 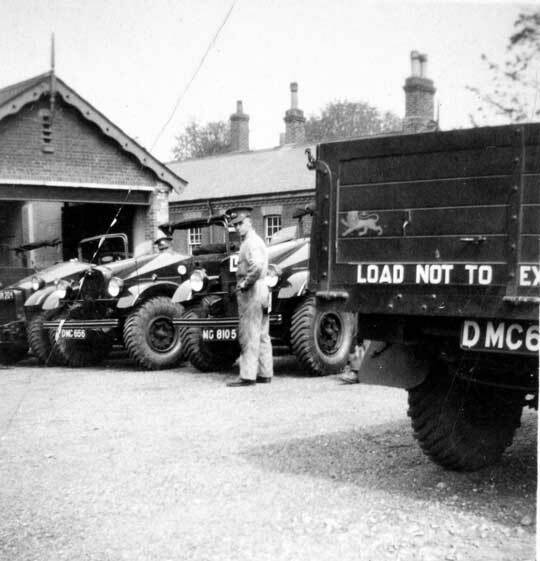 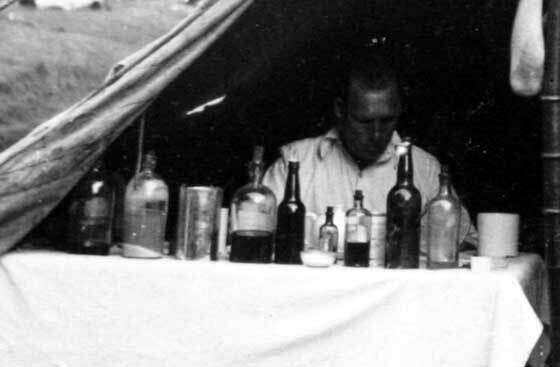 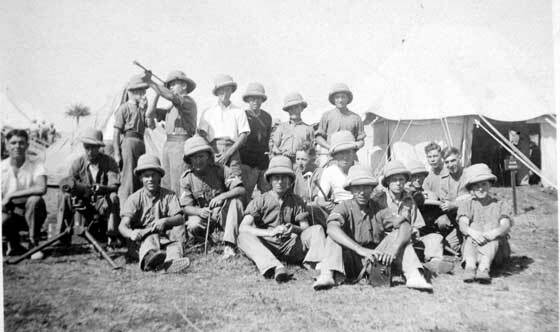 Soldiers at tented camp in England. 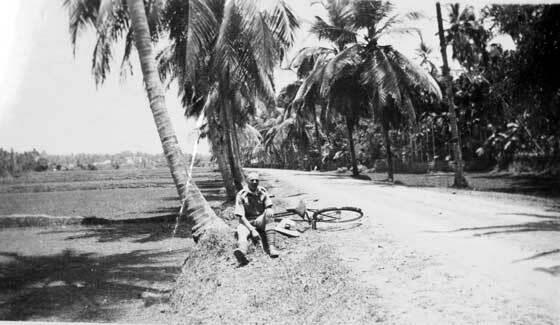 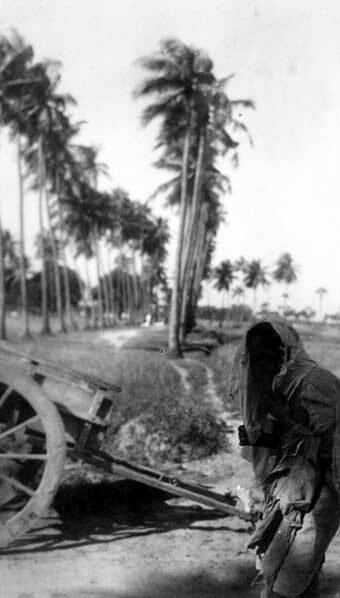 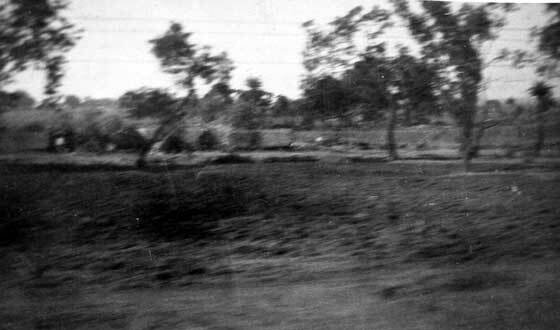 Resting at Mala, 1937, soldier with bicycle. 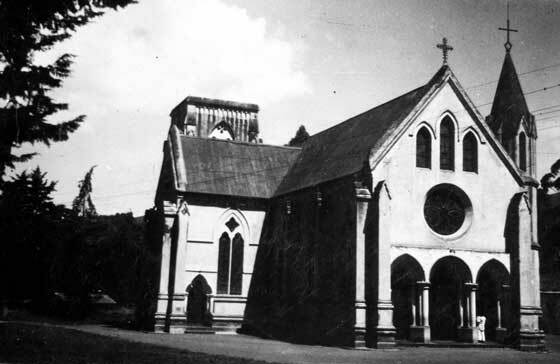 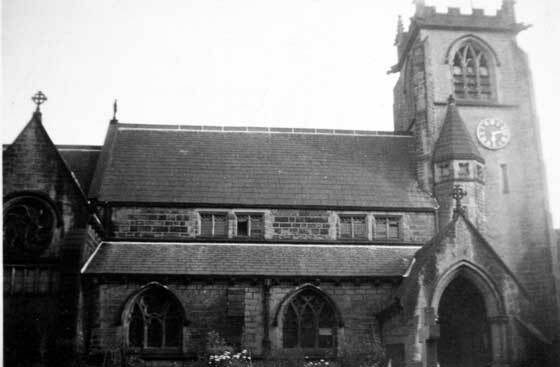 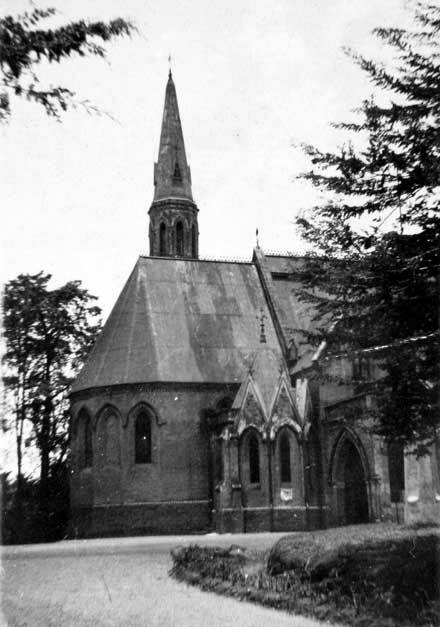 Church of England Church at Wellington, Southern India. 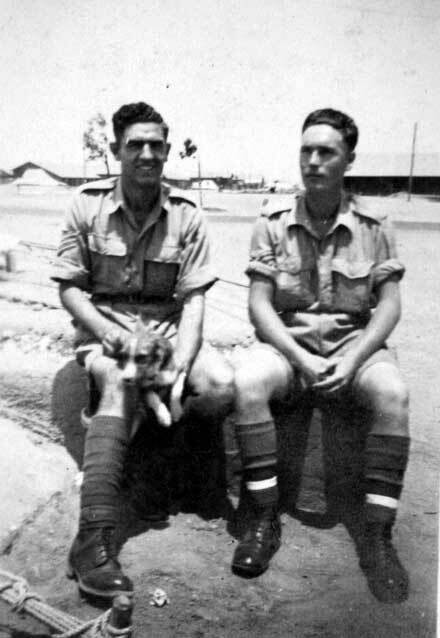 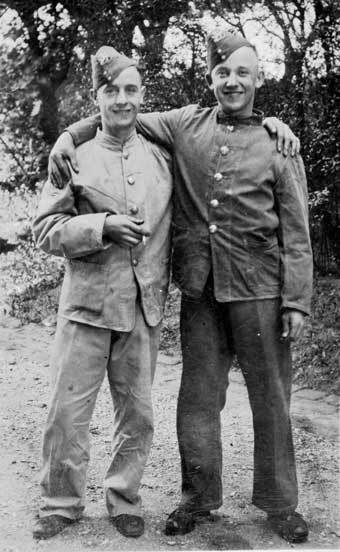 Two soldiers, including Lance Corporal John Thomas Green on the right. 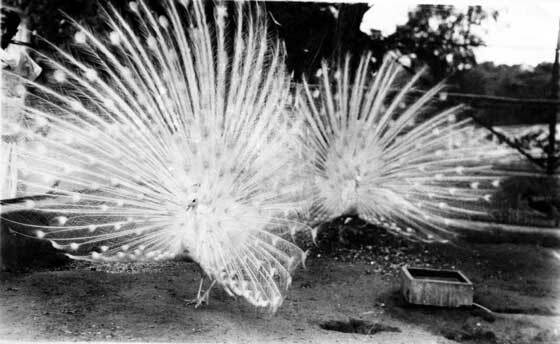 ‘Roll on head’s down’ Tented Camp, India. 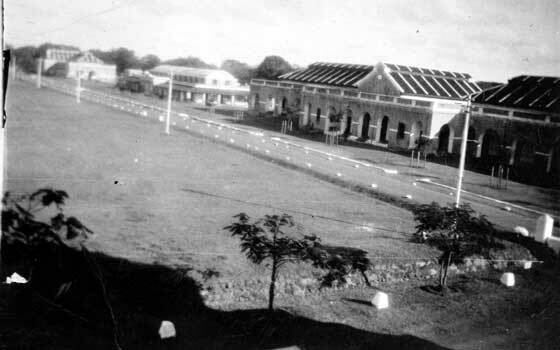 Gymkhana Grounds, Club near Wellington, India. 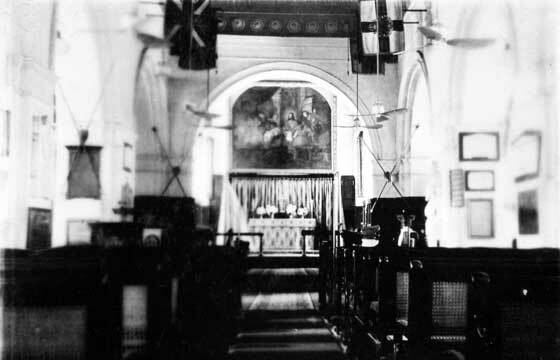 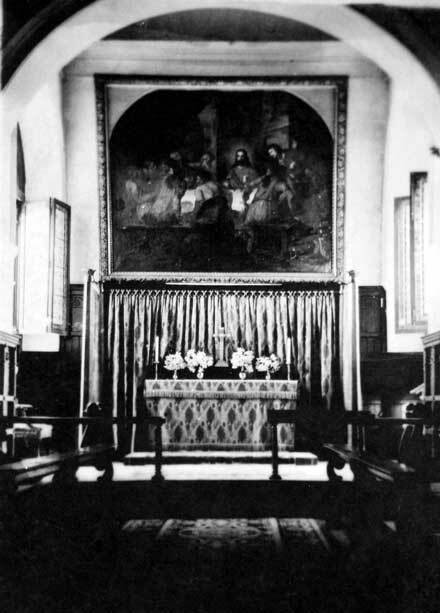 Church of England Church at Wellington, India, interior view. 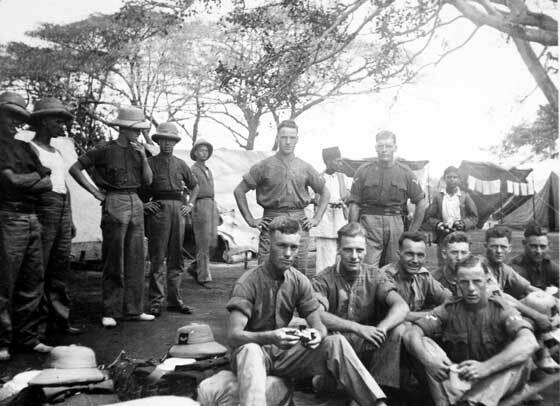 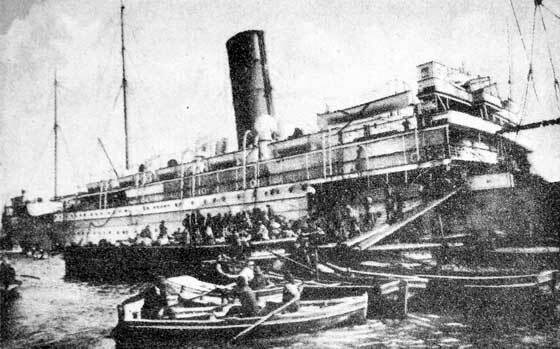 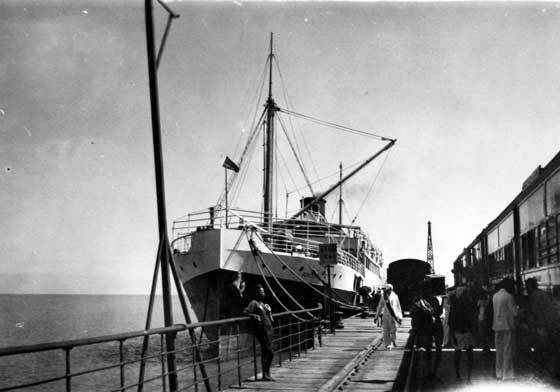 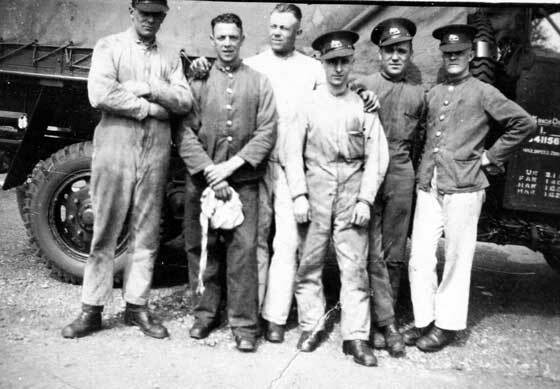 Soldiers on deck of troopship on the way to India. 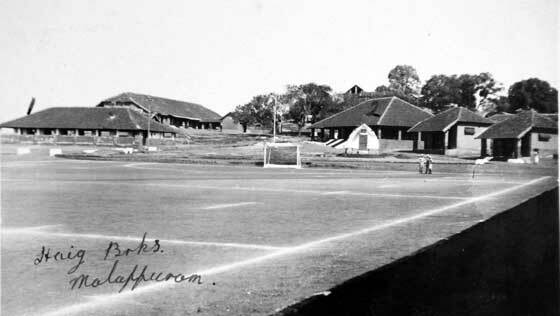 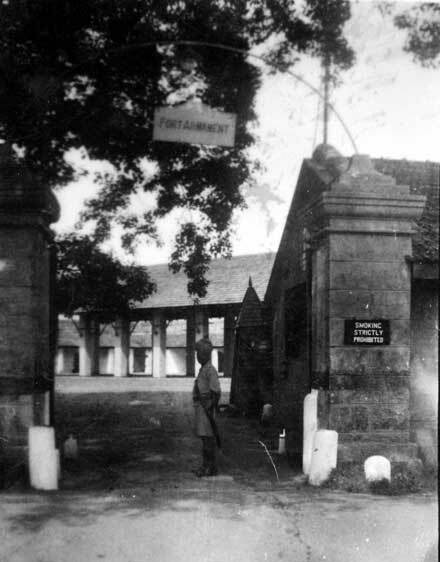 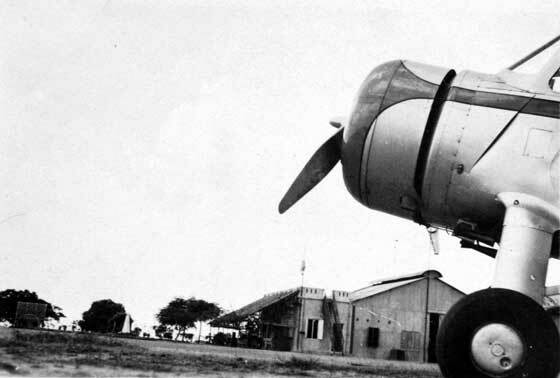 Haig Barracks, Malappuram, India. 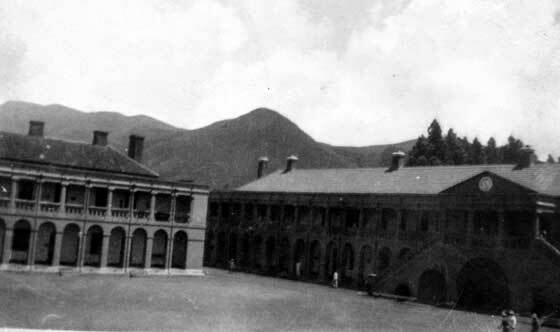 Number ‘1’ marking the school and number ‘2’ the guard room. 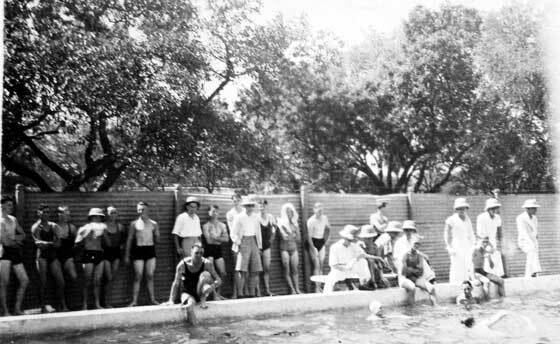 Trying to keep cool at camp, 1938. 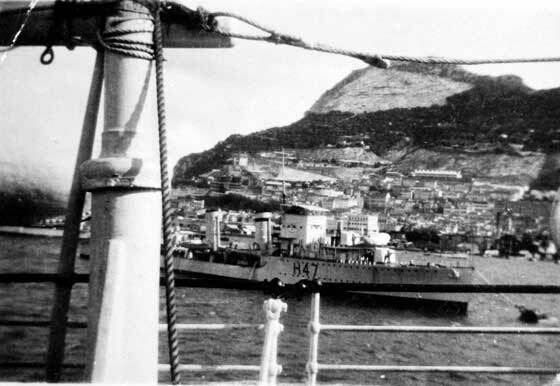 With B Class Destroyer, H47, HMS Blanche, built for the Royal Navy in 1930. 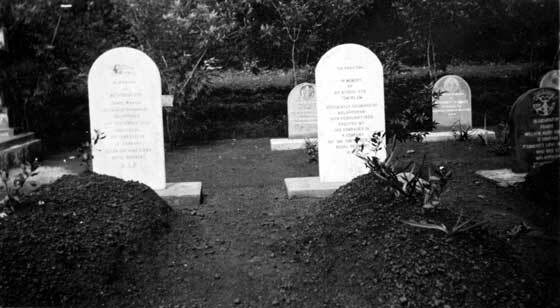 Graves of Private James Martin and Private Tom Irlam. 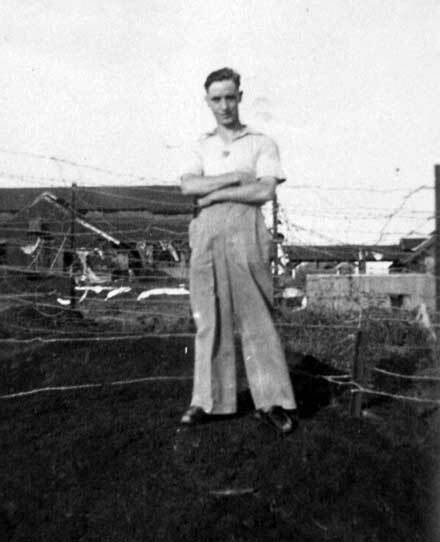 Grave of Private James Martin, number 3710067, A Company, 1st Battalion, King’s Own. 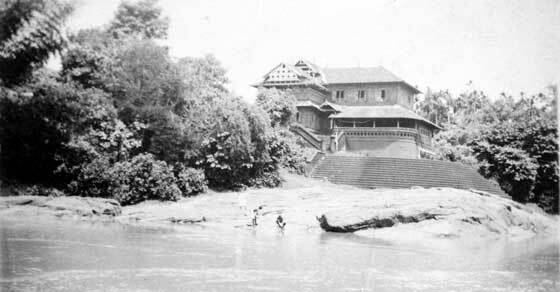 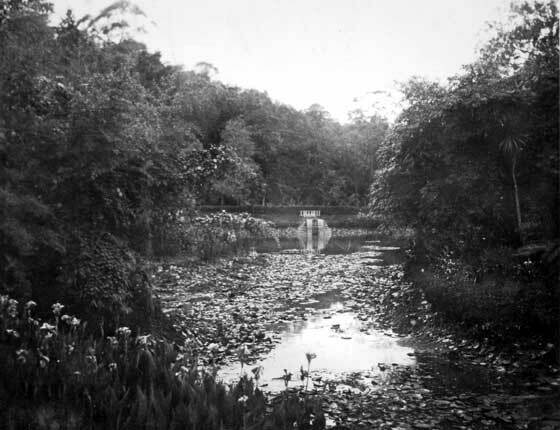 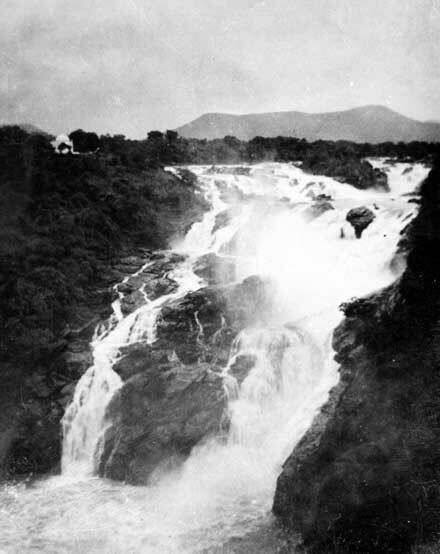 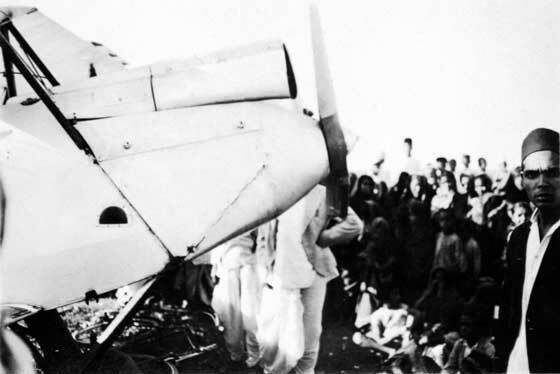 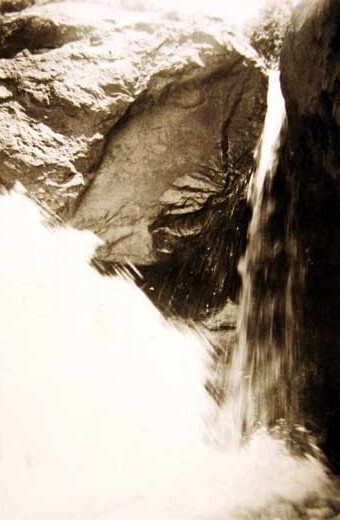 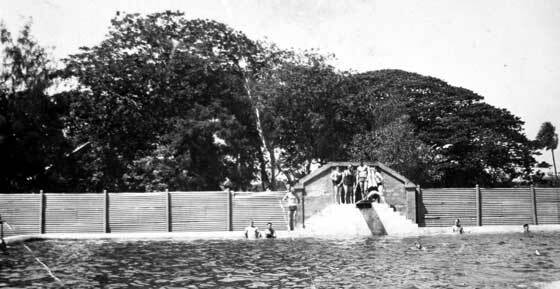 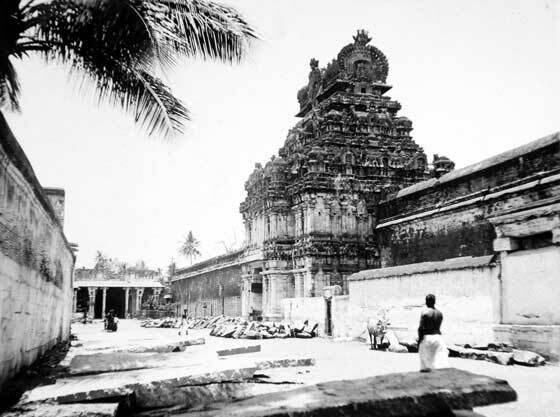 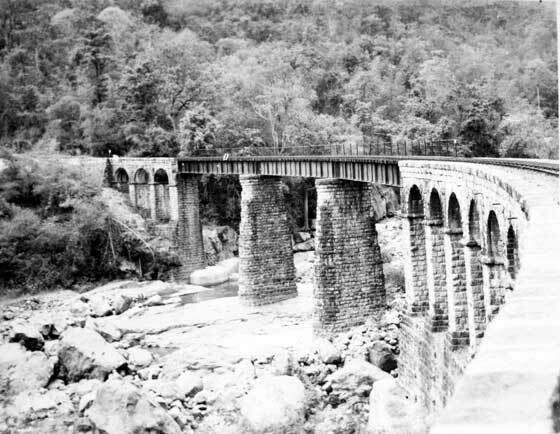 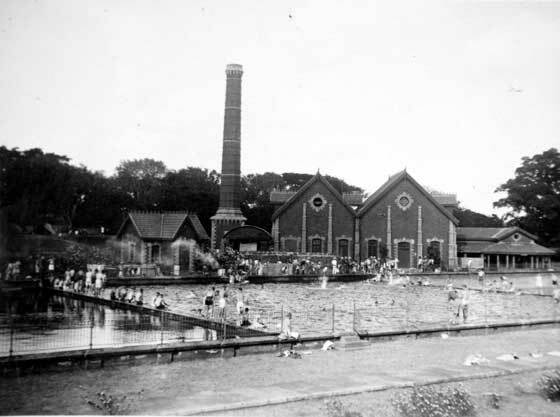 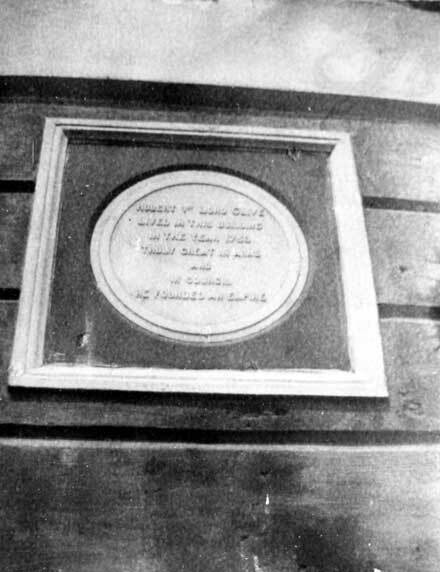 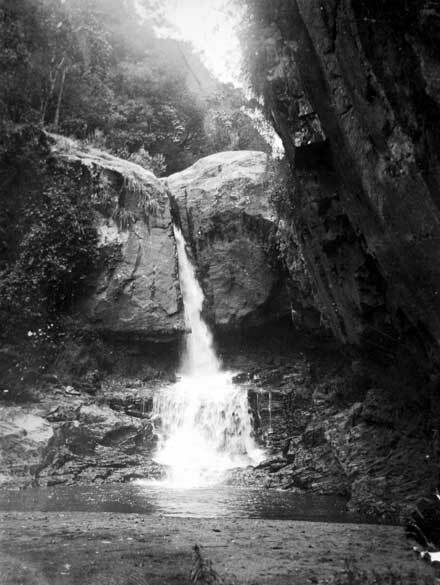 Accidentally drowned at Maluppuram, 21 Sep 1936. 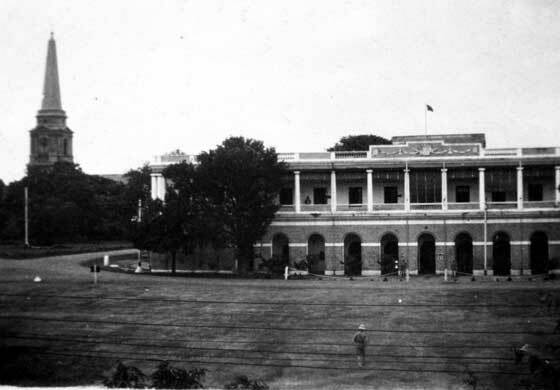 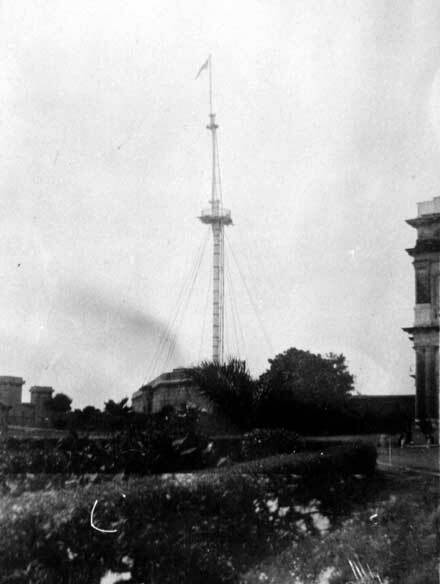 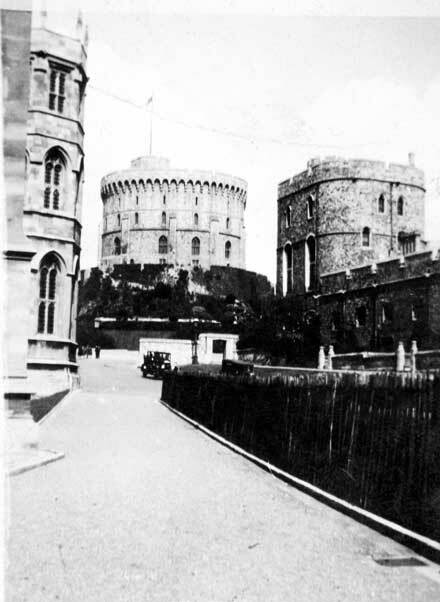 Whilst based at Wellington Barracks, India. 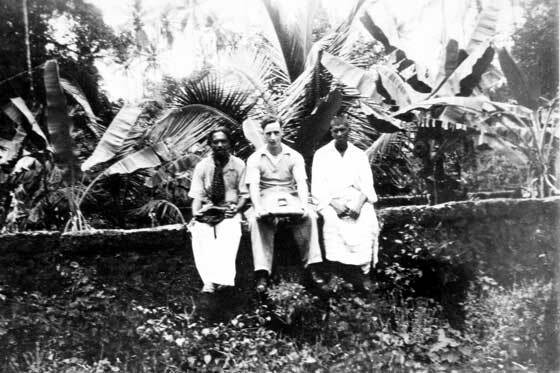 Grave of Private Tom Irlam, number 3710110, 1st Battalion, King’s Own Royal Regiment, who died on 10 Feb 1935 accidentally drowned near Kodum Kayat Mosqe, Wellington, Southern India. 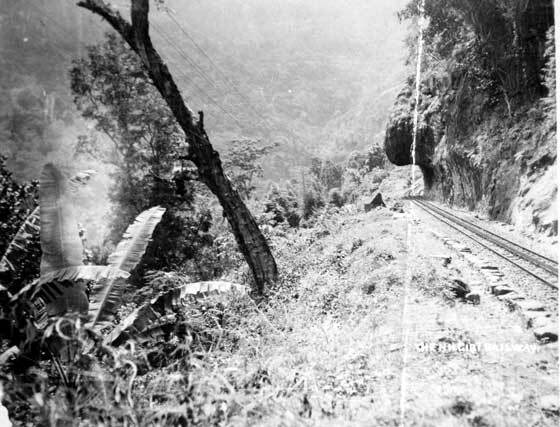 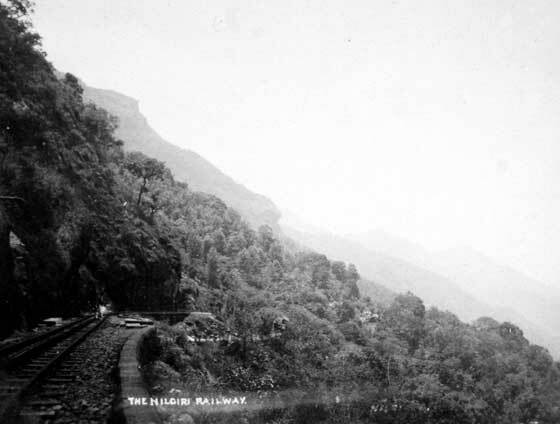 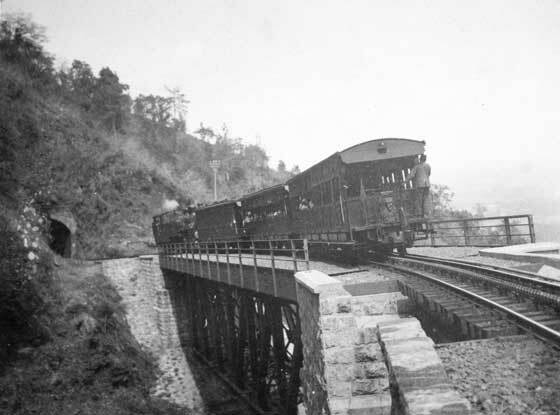 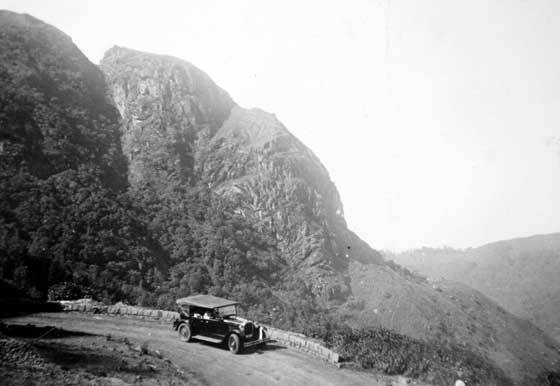 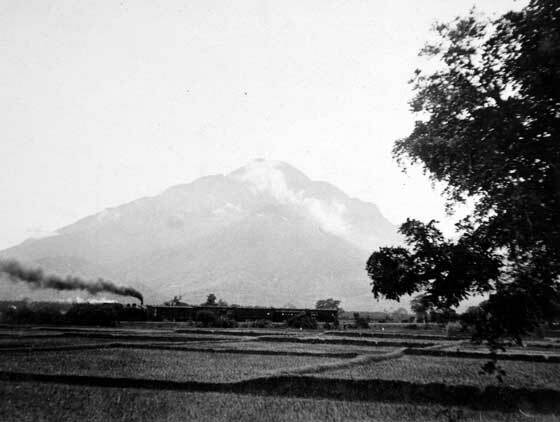 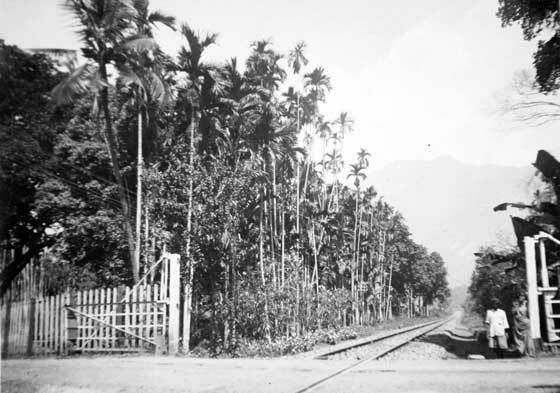 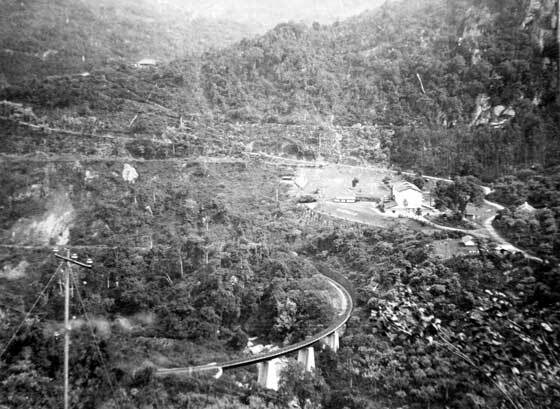 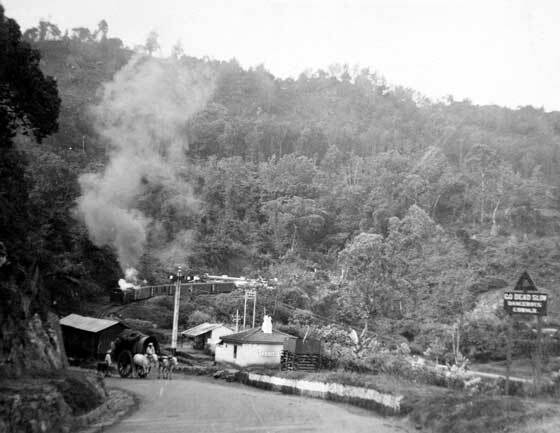 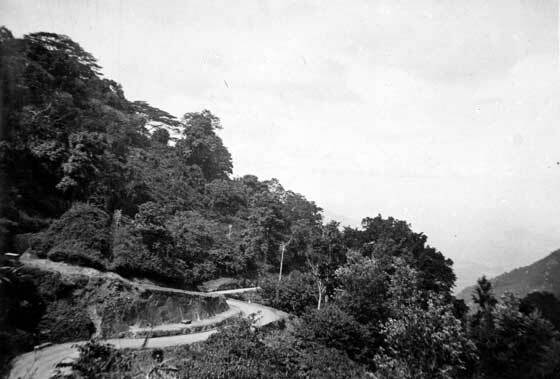 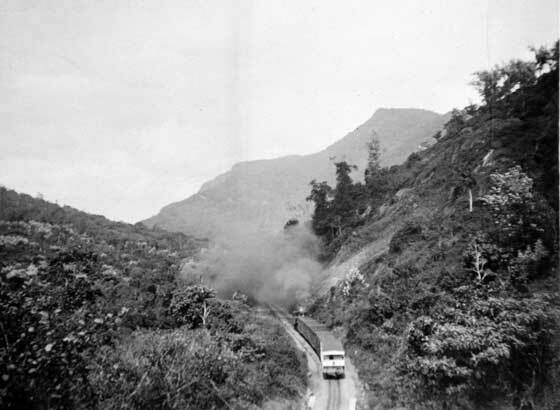 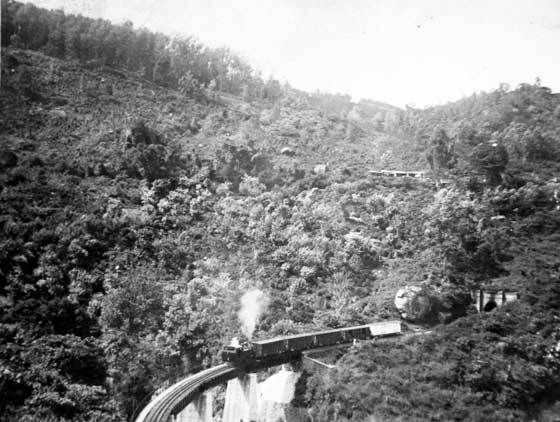 View of Glendale Tea Factory and surrounding area, Nilgiri Railway, circa 1935, Southern India. 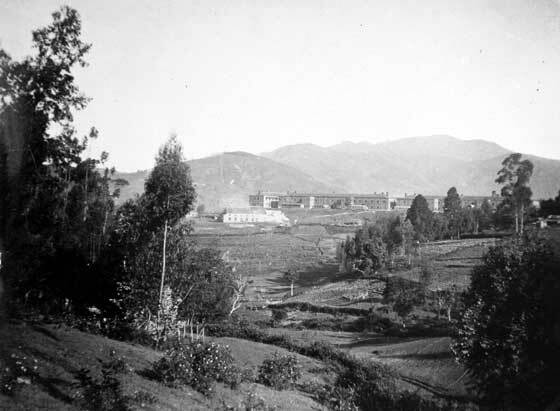 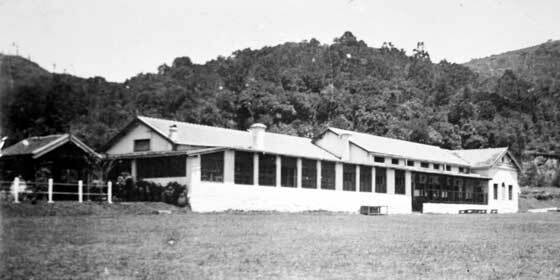 The word ‘Glendale’ can be seen spelt out on the hill side near a large building which is the tea factory of the firm of that name. 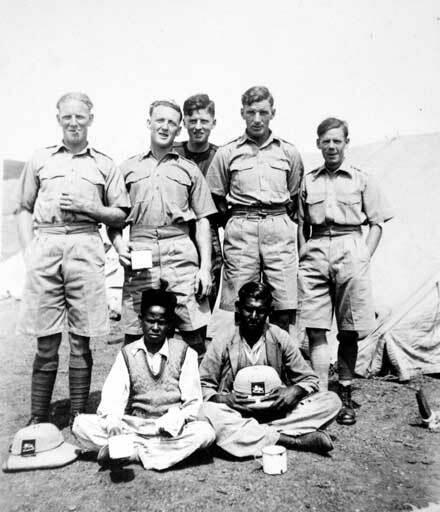 Five soldiers and two Indians, circa 1938. 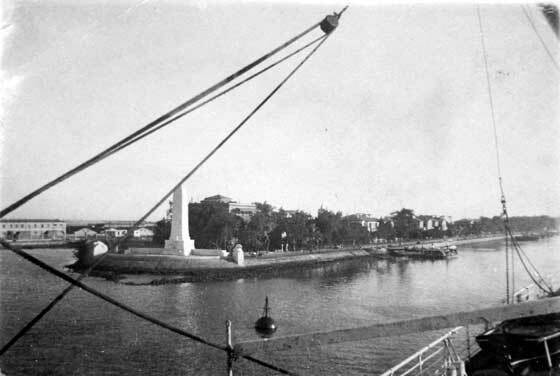 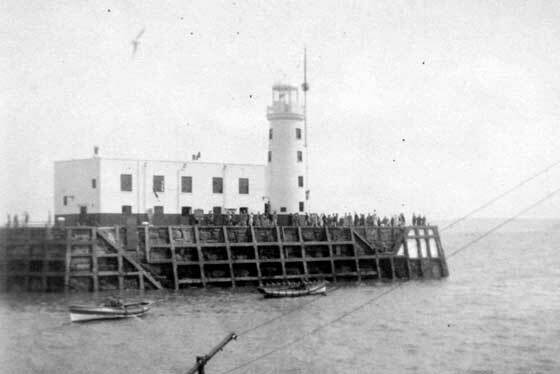 How coaling is done at Port Said. 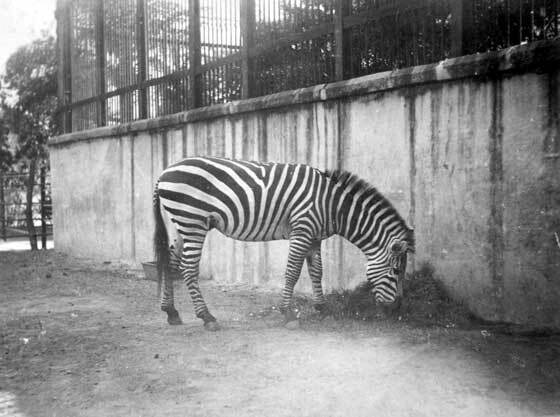 A curious and interesting view perhaps unique in the world. 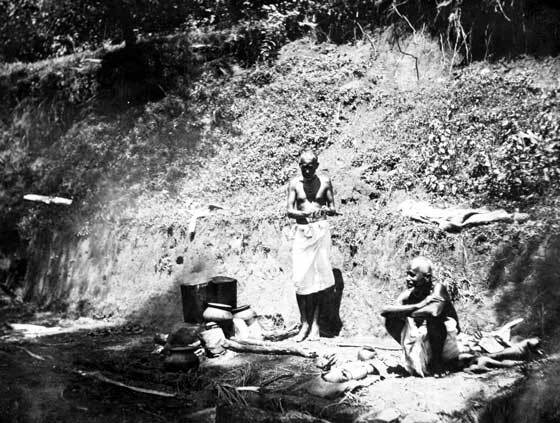 Hundreds of natives are busy accompanying their hard work by songs and prayer. 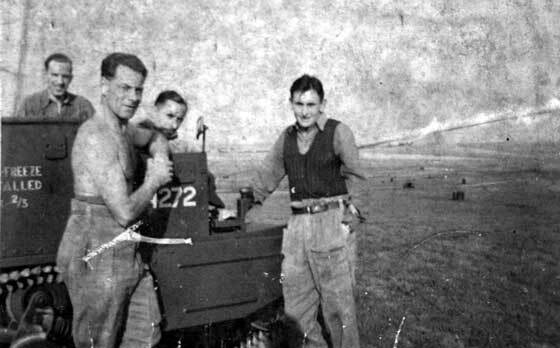 Four soldiers and a bren gun carrier, circa Second World War. 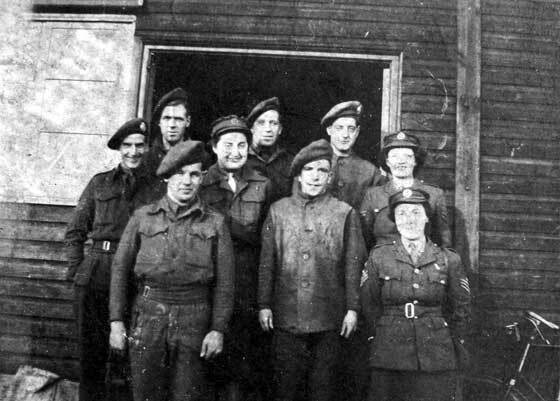 Group of three ATS and six soldiers, Second World War. 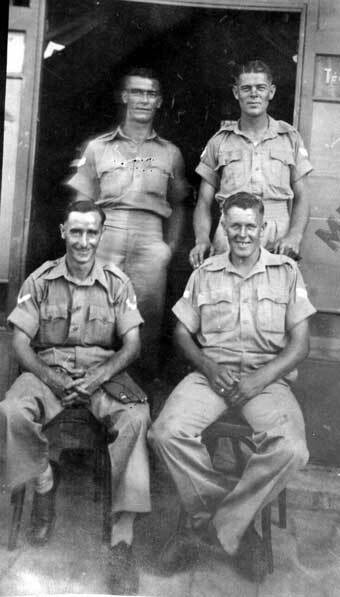 Four soldiers, Second World War. 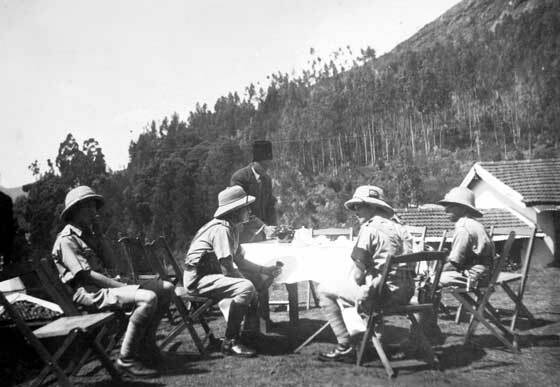 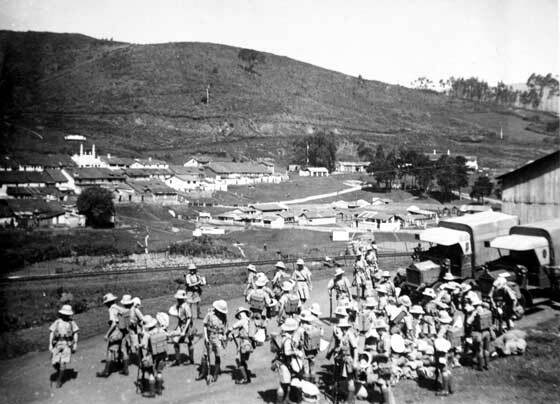 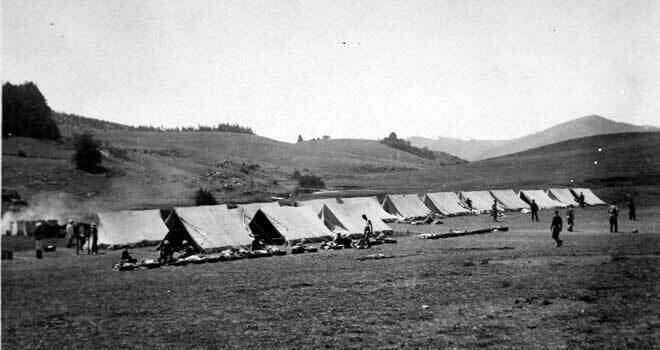 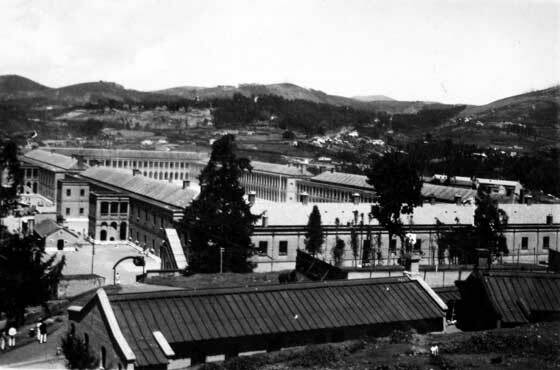 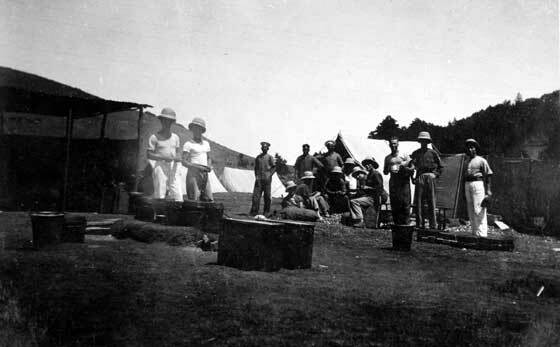 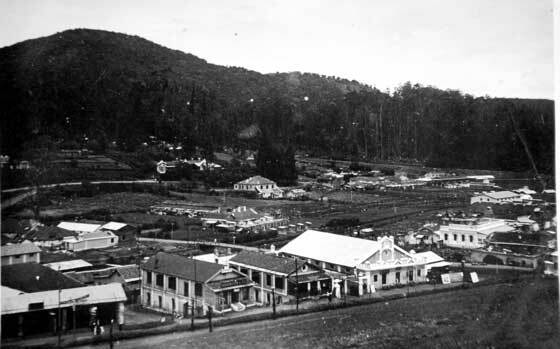 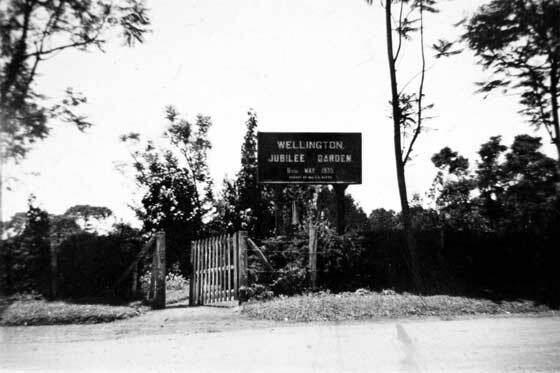 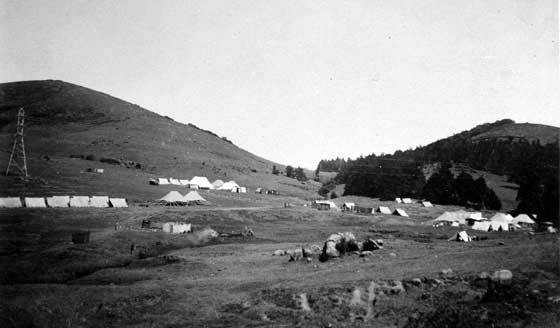 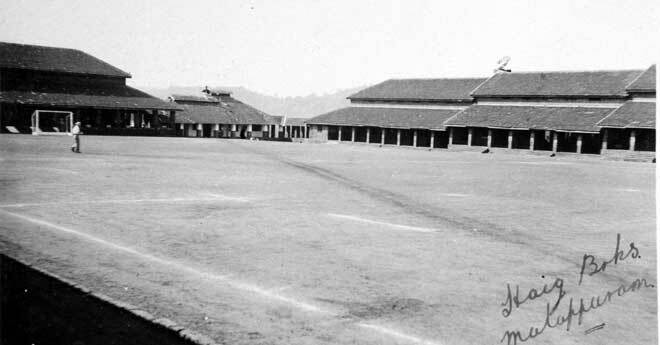 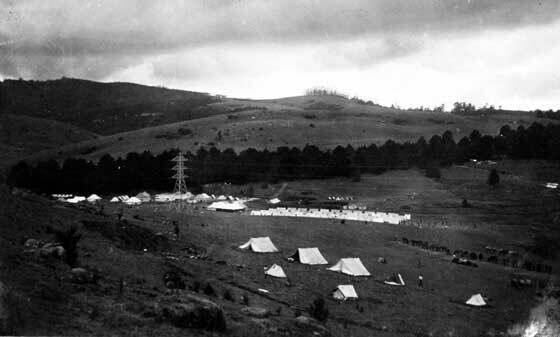 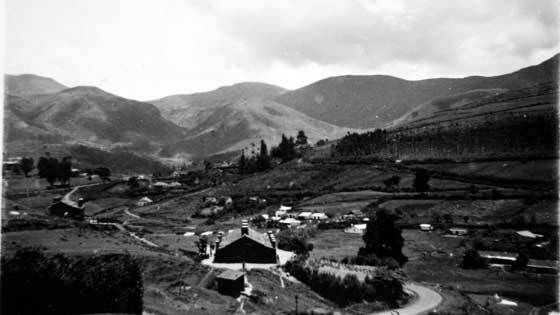 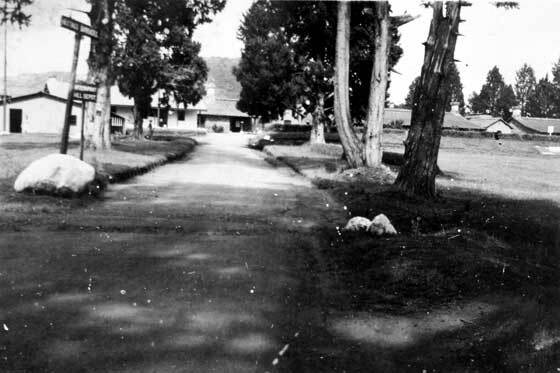 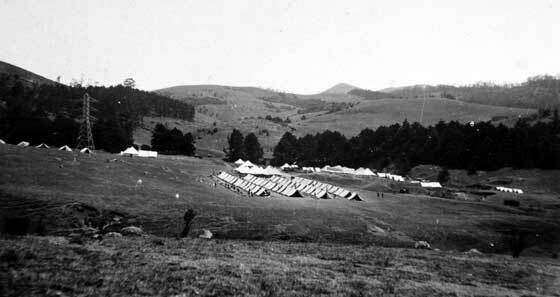 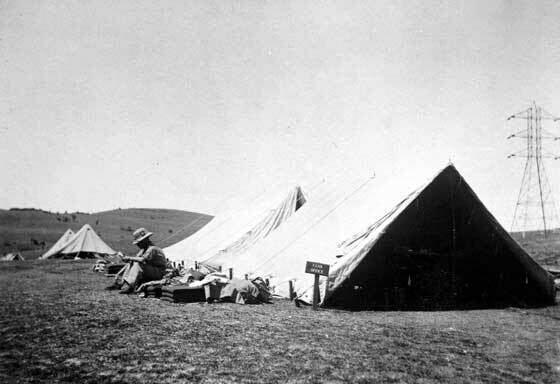 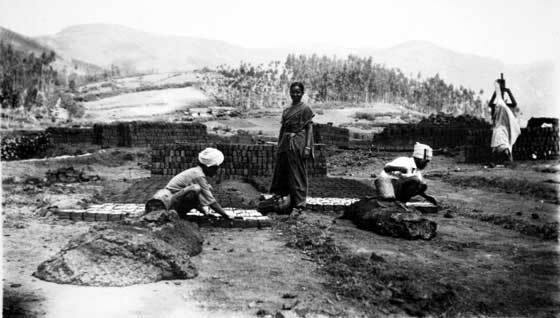 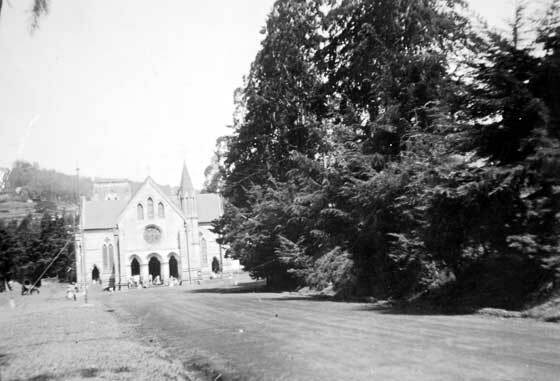 Tented camp at Ooty, India, 1937. 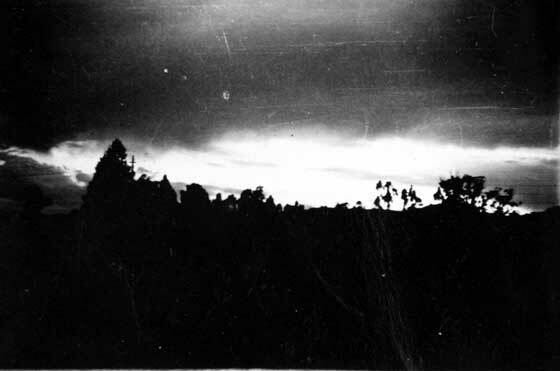 ‘Storm coming on’ over tented camp. 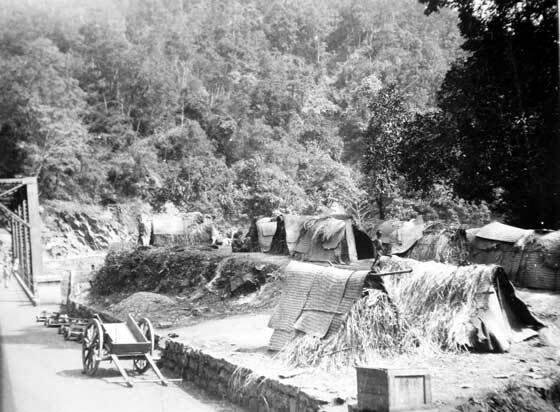 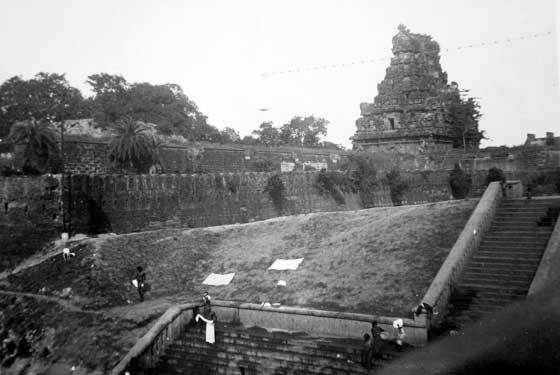 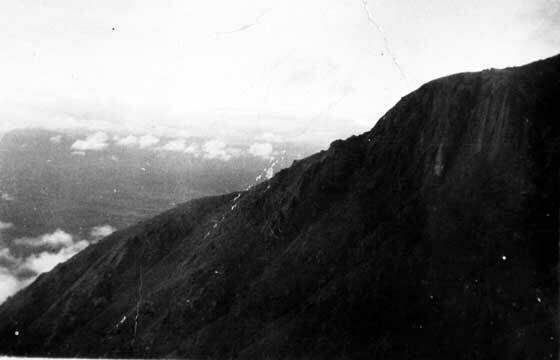 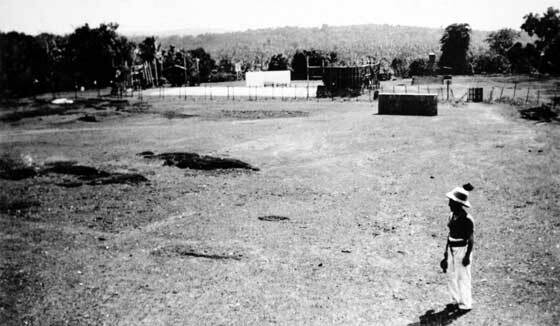 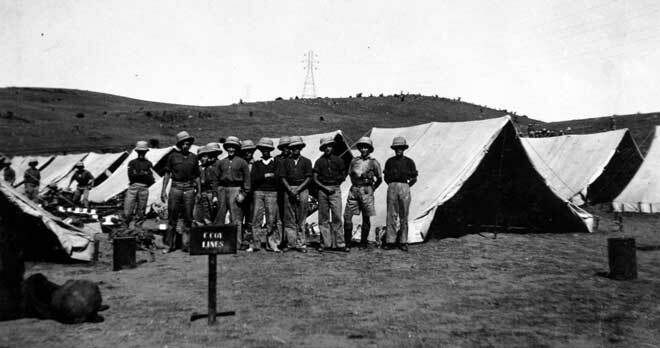 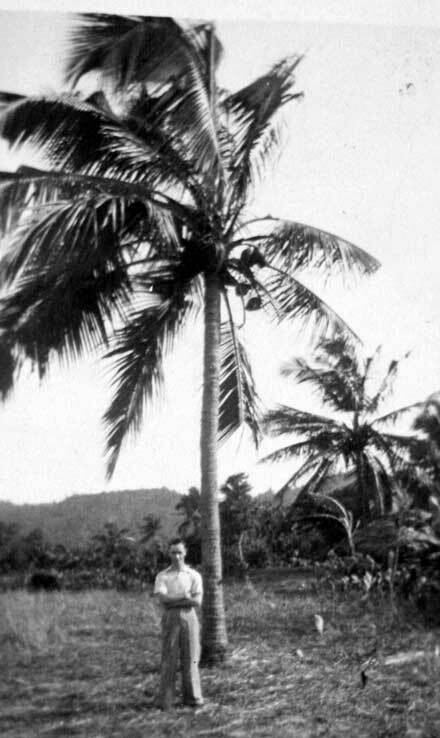 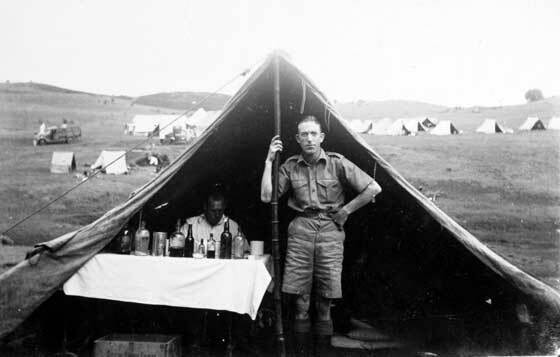 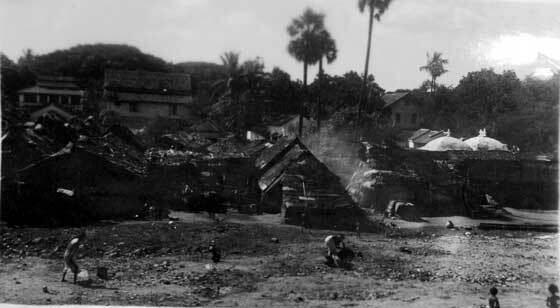 Tented Camp, Southern India, 1938, used by soldiers on route march. 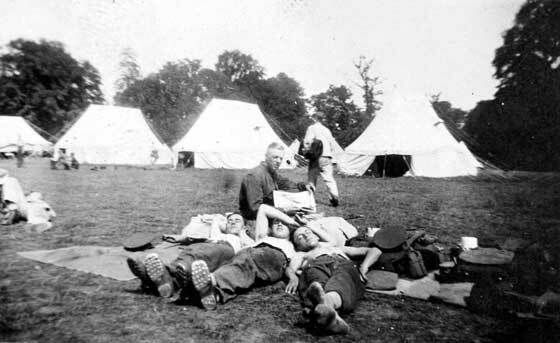 Captioned “don’t go sick, go mad’ Assuming that this is the medical tent? 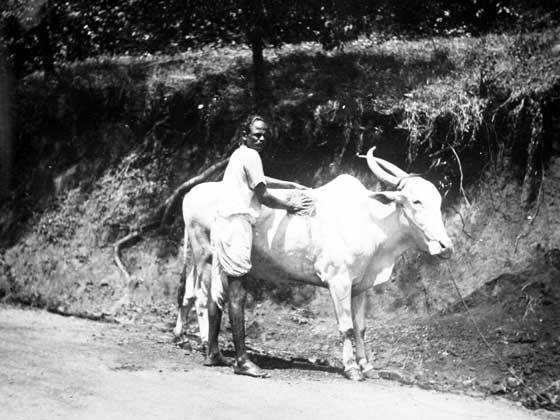 Indian and cow, Malappuram High Street, India. 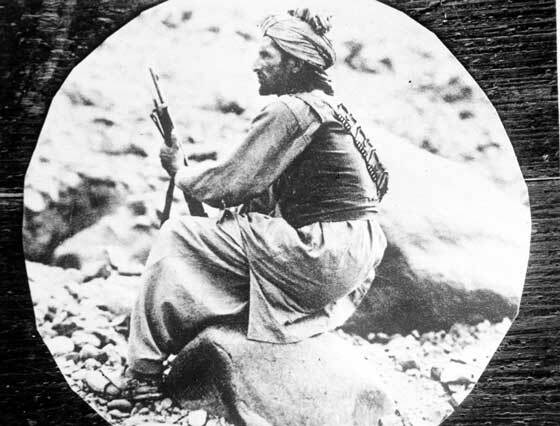 Copied photograph of armed man. 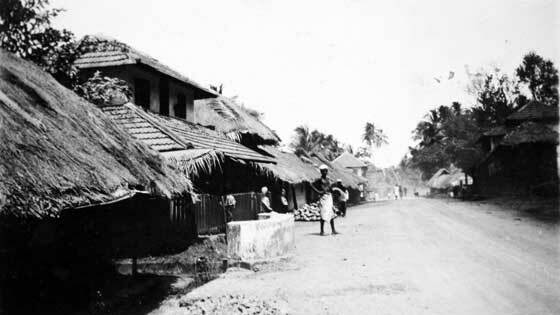 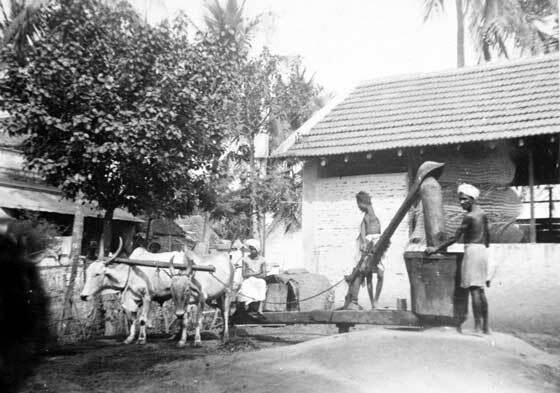 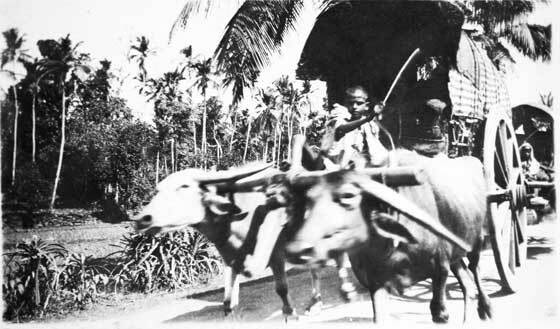 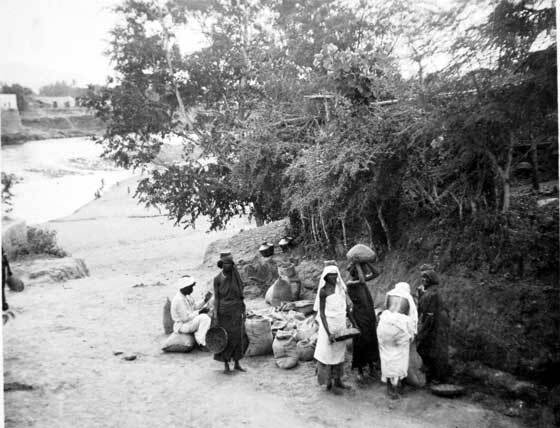 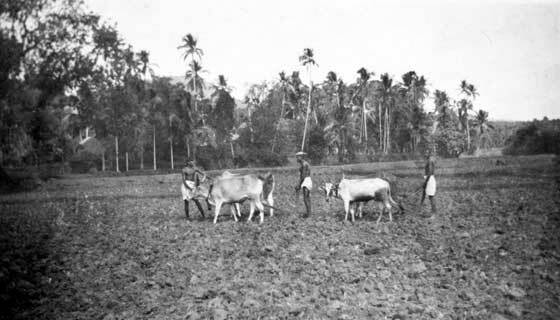 Side street in Malappuram, Southern India, circa 1938. 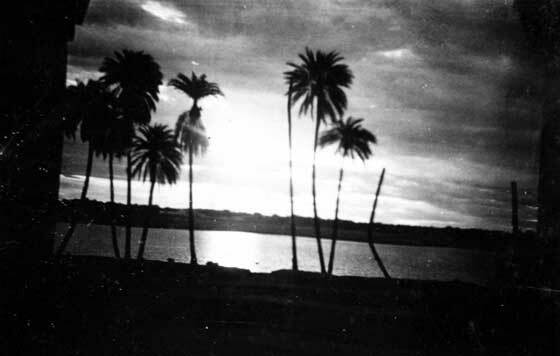 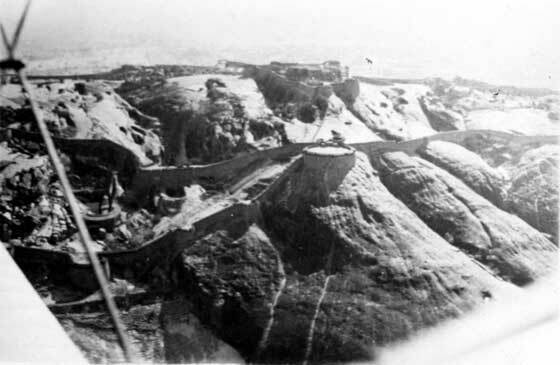 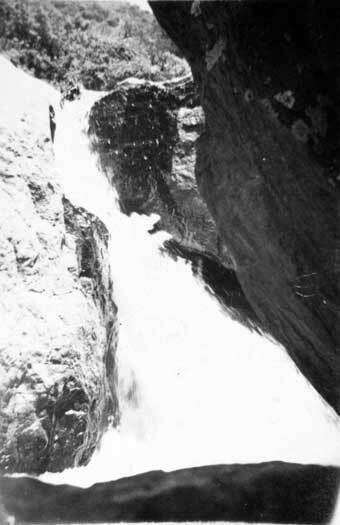 Copy photograph, possibly North West Frontier, late 1930s. 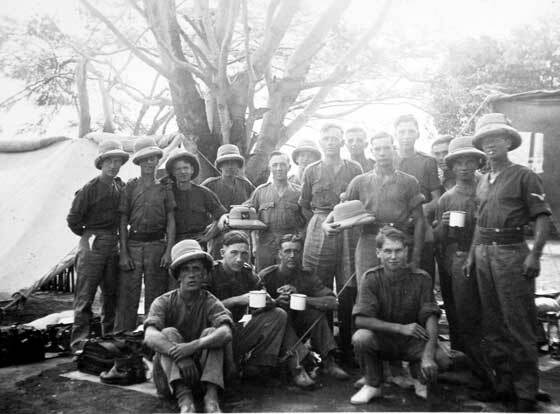 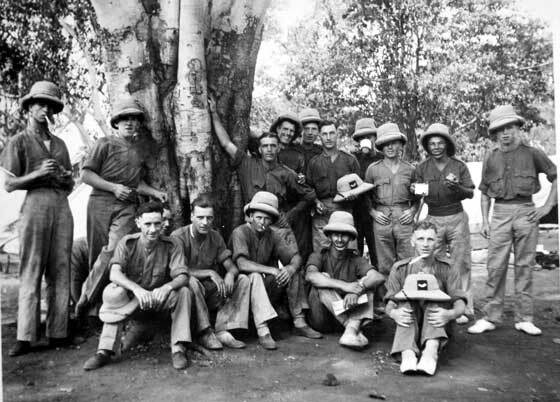 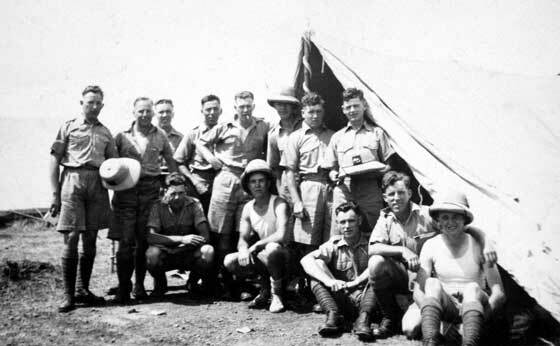 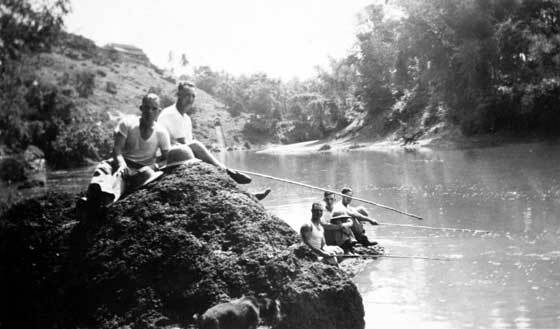 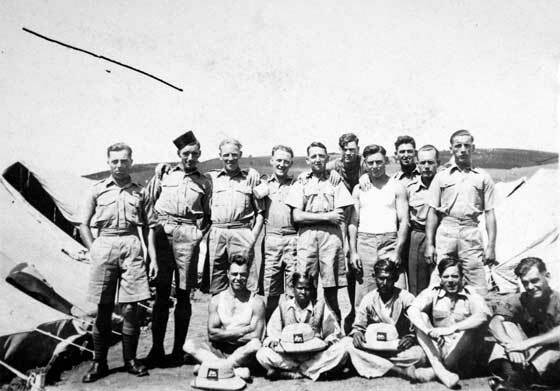 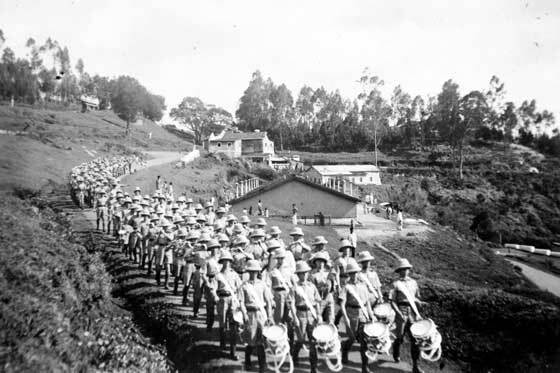 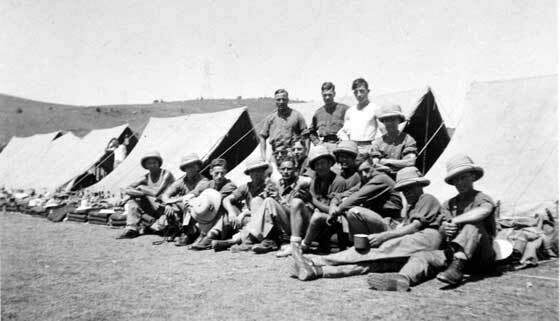 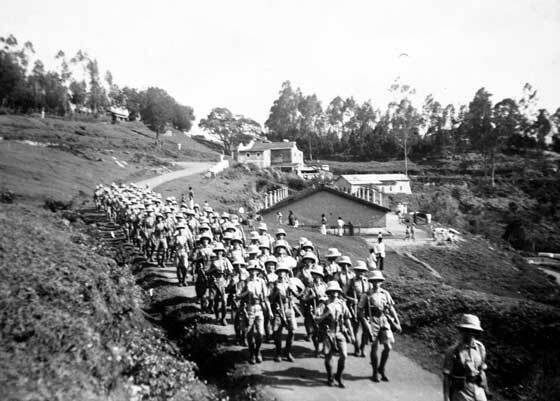 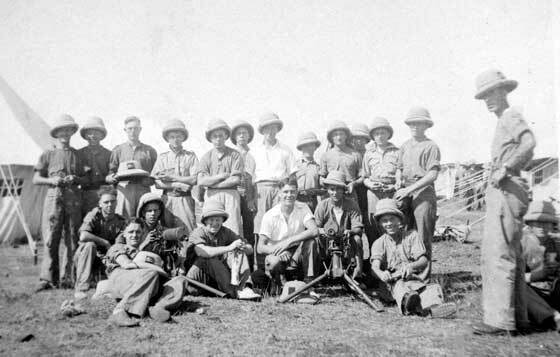 Group of soldiers of the 1st Battalion, King’s Own Royal Regiment, Southern India, 1938, at camp. 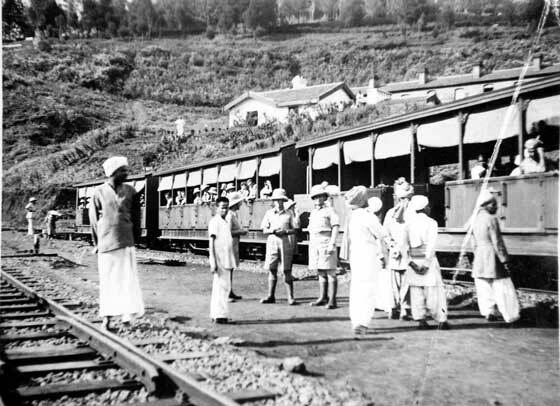 On the road to Ooty.